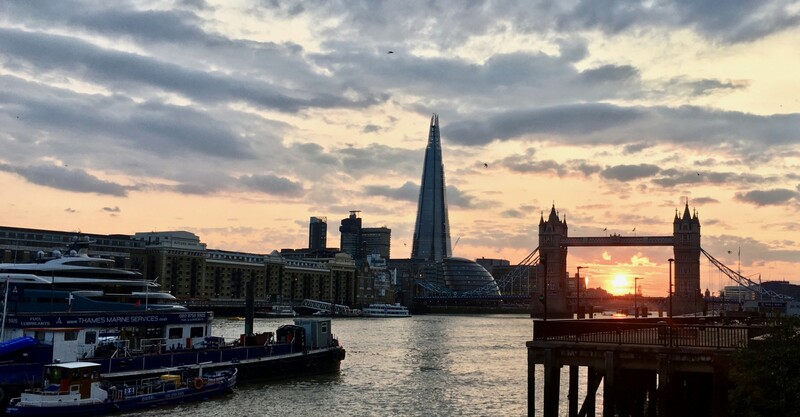 On a pleasant evening following heavy rain this was an urban ramble through at least 800 years of history via Aldgate to a view of Tower Bridge (the river Thames ,of course, has been there much longer than 800 years!) with the setting sun centrally placed for maximum dramatic effect. 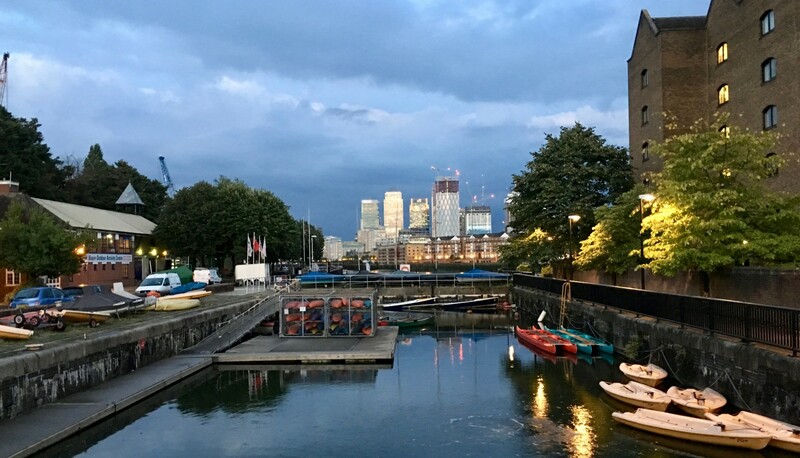 Then through Wapping, Shadwell and Limehouse with a grave finale in Tower Hamlets Cemetery, where you can almost imagine you are in a Dark Sky location! 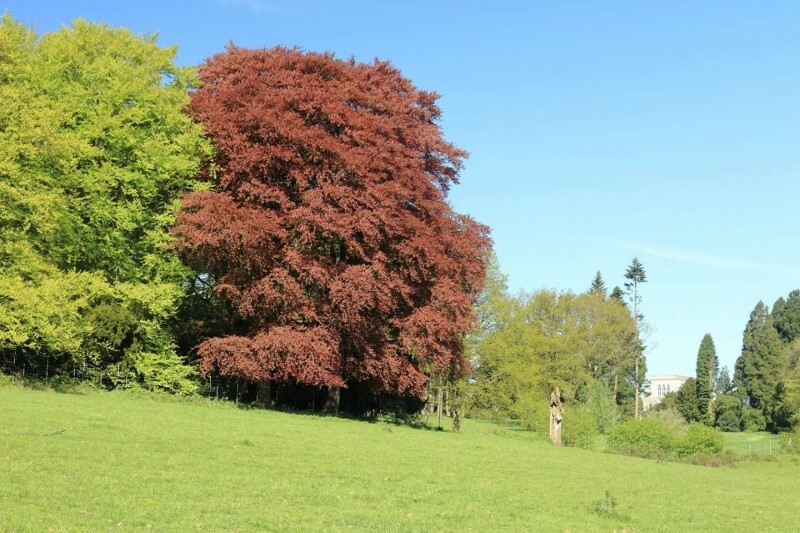 Ideal walking weather, splendid views, lots of hills (c2500 feet of ascent). 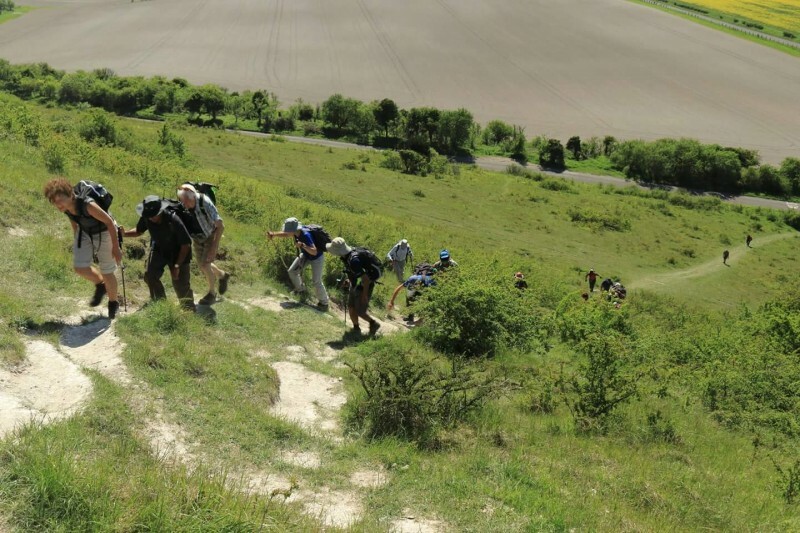 The steep route up Box Hill from Pixham End gave a taste of what was to come. 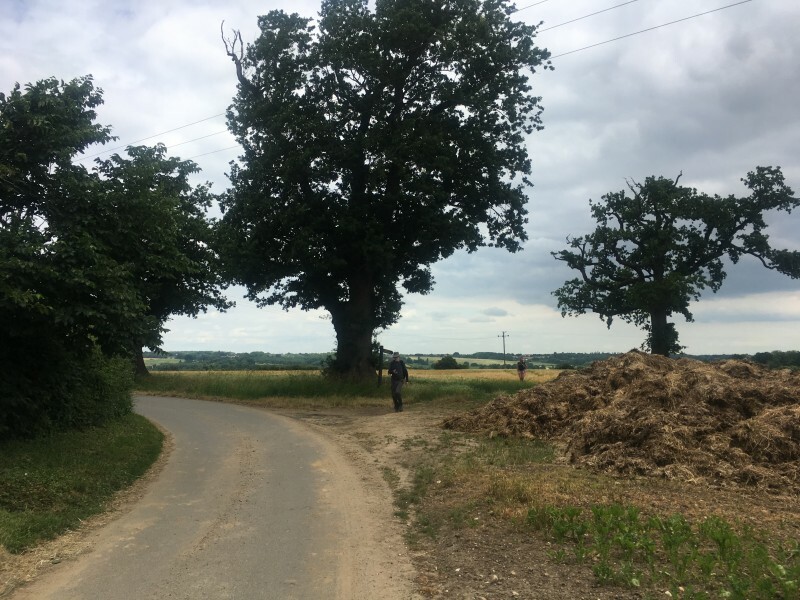 North Downs to Headley Heath where despite the vast quantity of paths on offer, the leader decided to add a few new ones in an off piste section of" bundu bashing” for the benefit of our South African new comer. 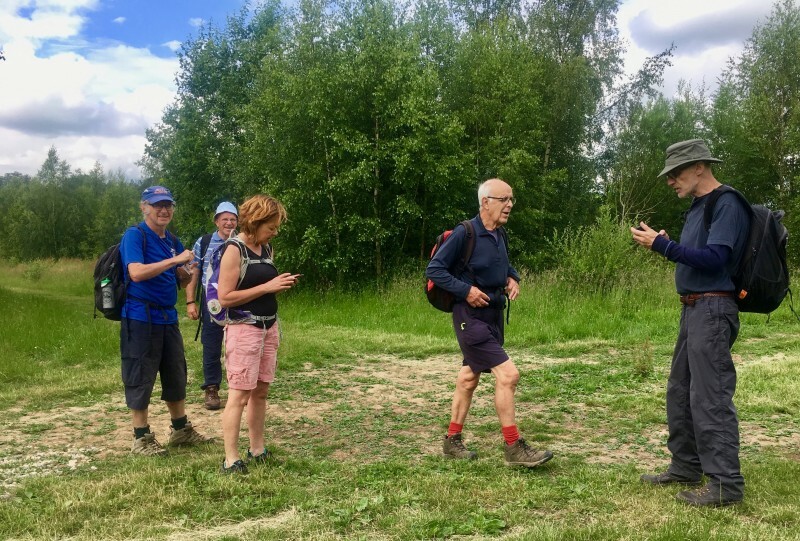 On Gavin’s GPS it looked like the aimless wanderings of an inebriated walker, but with the leader’s judgement (or pure luck!) 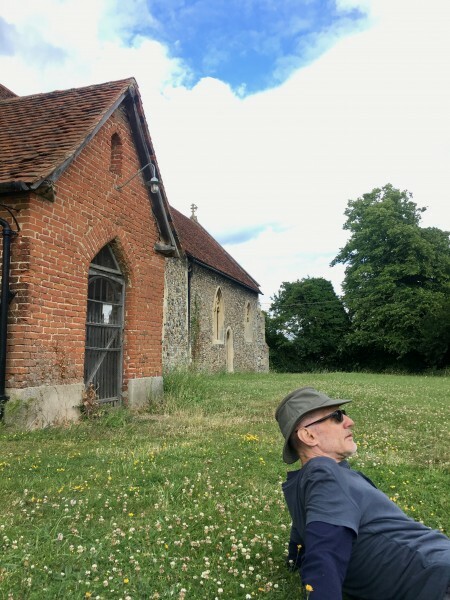 we soon returned to the correct west path and down to Mickleham for lunch at the Running Horse or church for picnic opposite. A wedding party gave the opportunity for a vintage car photo shot, then the Mole valley and up to the gloomy vegetation of Druids Grove. 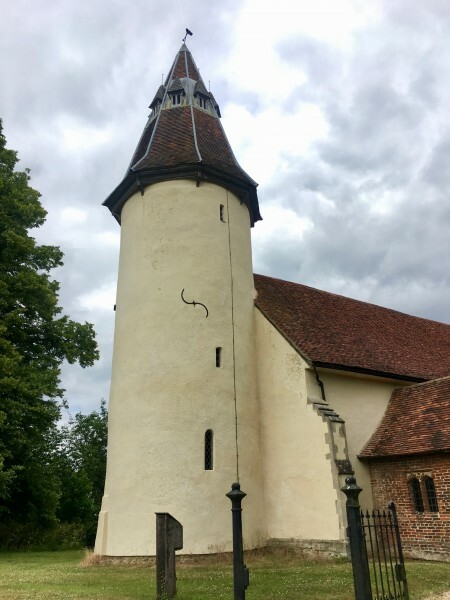 A few more loops and the great spire of Ranmore common church acted as a beacon as we rejoined the North Downs and a final stroll through Denbies vineyard. 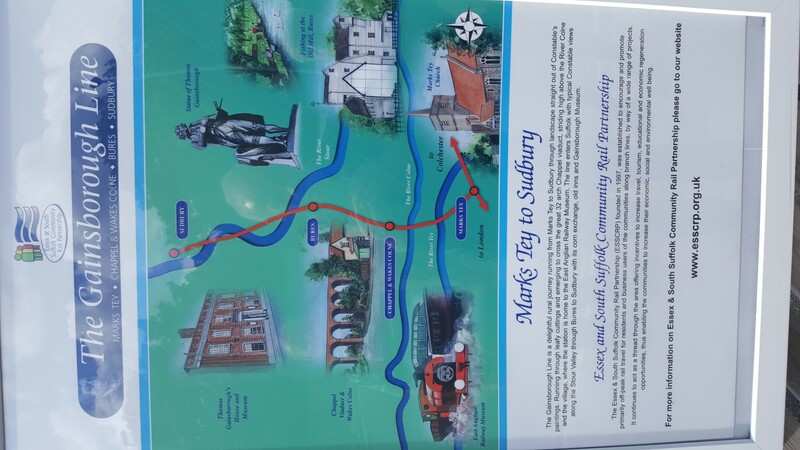 Today’s adventure began at the large commuter village of Marks Tey some seven miles west of Colchester and the starting point for the single track branch line to Sudbury. 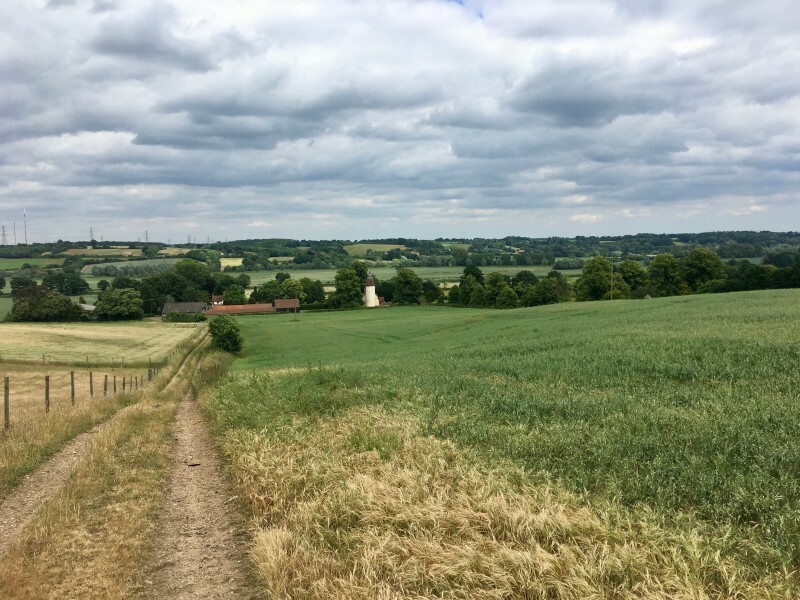 Our route meandered northwards to the water meadows of the Colne valley before crossing the watershed and exploring the rolling countryside bordering the western flank of the Stour valley, a landscape much favoured by Gainsborough and Constable. Our wanderings led us to, Great Tey with its 16th century pub and Norman church with a unique central tower, Chappel a riverside village famous for its 1066ft long brick built rail viaduct, Fordham Hall estate 500 acres which thanks to an anonymous donation is now managed by the Woodland Trust as public access land and our destination of Bures a village on the river Stour half in Essex and half in Suffolk. 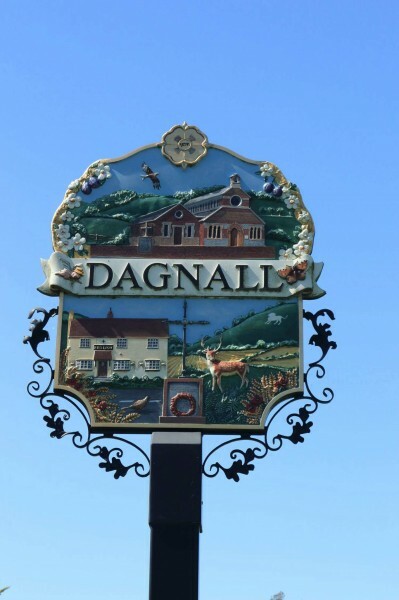 An area not usually visited by London LDWA but a great example of how diverse the county of Essex is and to quote from a knowledgeable member well worth the train fare even if the beer is expensive. 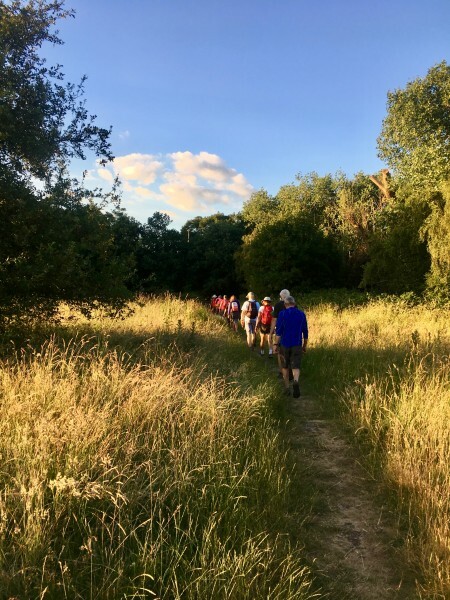 There were 15 of us, it was a brilliant, luminous evening; Richmond Park was wonderfully serene and we enjoyed our stroll across Wimbledon Common and park to the Wandle pub in Earlsfield. 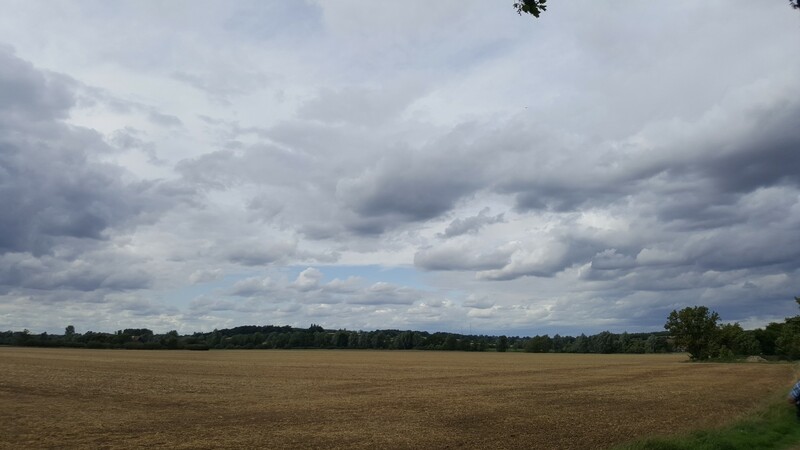 A cooler day gave ideal walking conditions and the heavy rain of yesterday even saw the return of a few short sections of mud. 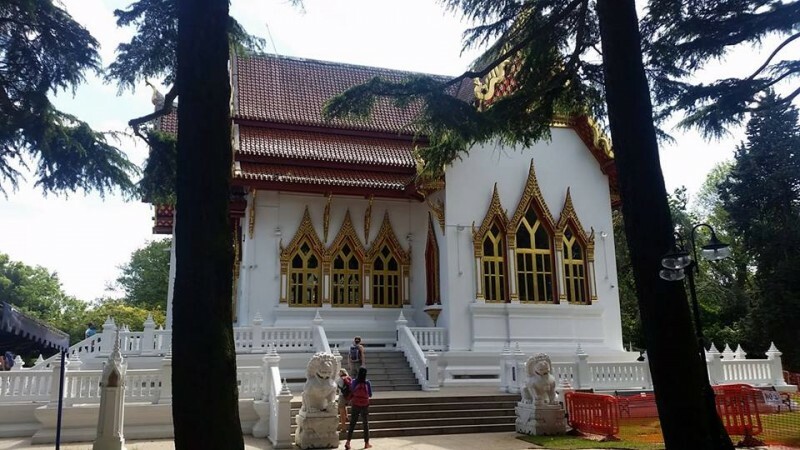 It was almost a relief after the hard baked concrete of some paths. 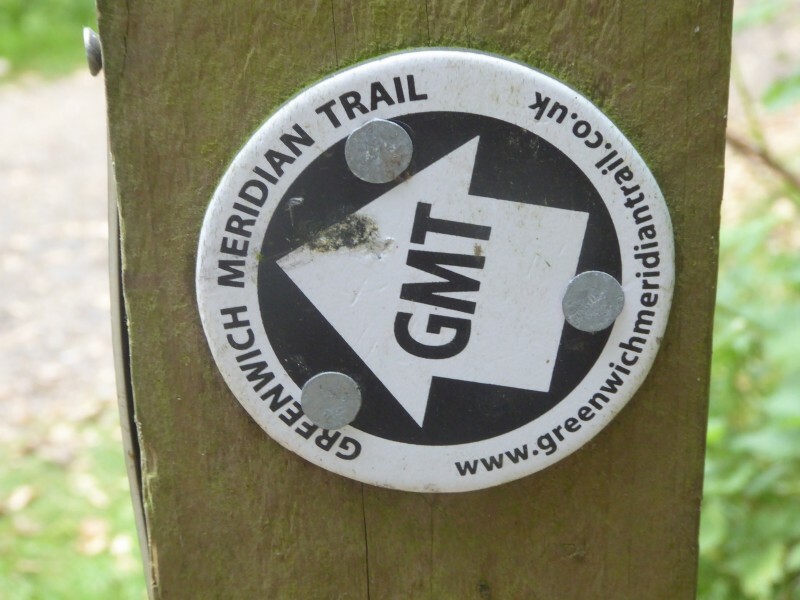 The Millennium trail over Redhill common, a short section of Greensand Way around Earlswood lakes and then south to Horley and the twin joys of the M23 and Gatwick. 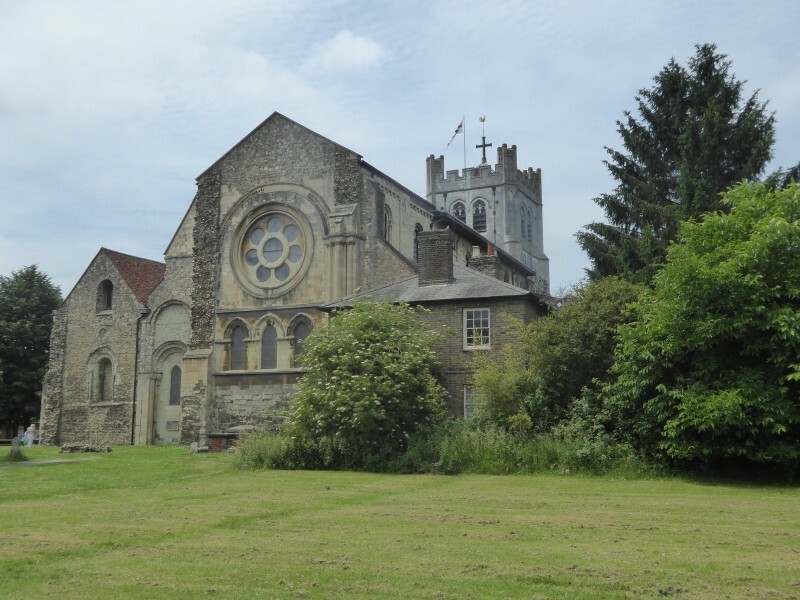 Picnic lunch in Barstow churchyard, a pub stop at the Prince Albert in Copthorne, and plentiful woodland to pass the manicured grounds of Worth Abbey school and finally west back to the Brighton railway line at our destination of Balcombe. 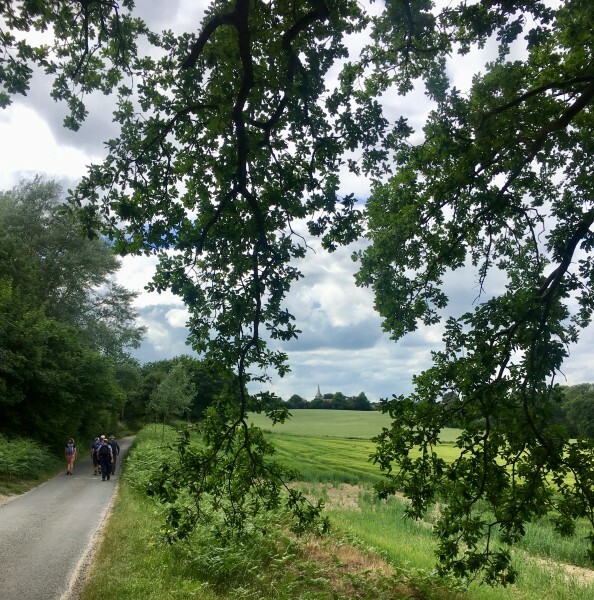 Despite this being the Low Weald with only small inclines, the GPS did show a cumulative ascent of approximately 400 metres. 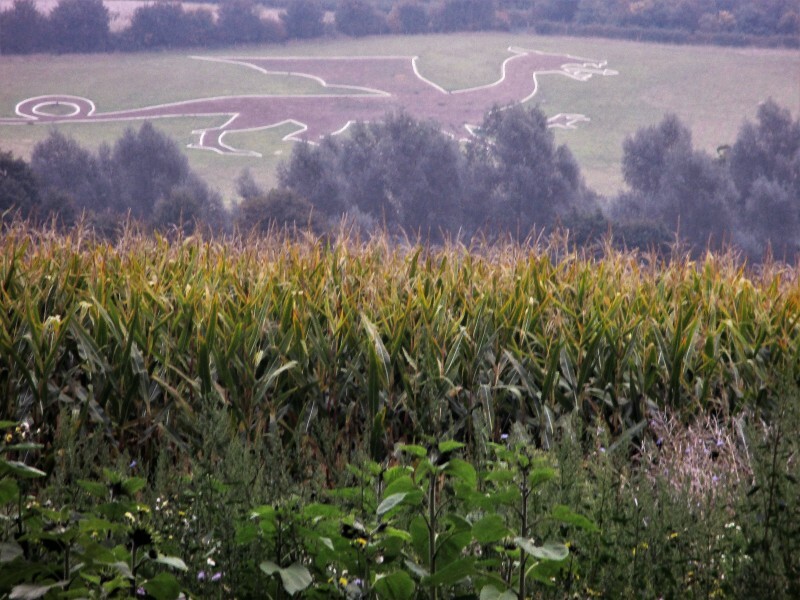 4 people still have the chance to claim their reward in Brighton if they walk all 4 sections. 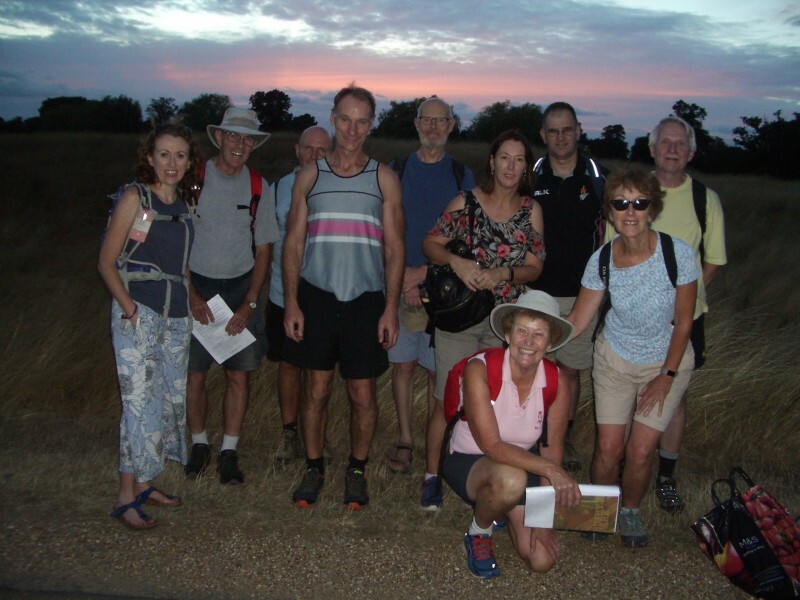 On a perfect evening Gail and John led nine other walkers into Bushy Park. In a shady grove Gail explained to the group and some assembled deer the history of the large WW2 military camp (mainly American) which became General Eisenhower's HQ in 1944 to plan the D-Day invasion. The camp was later used to co-ordinate the Berlin Airlift in 1948 and was finally demolished in 1962. 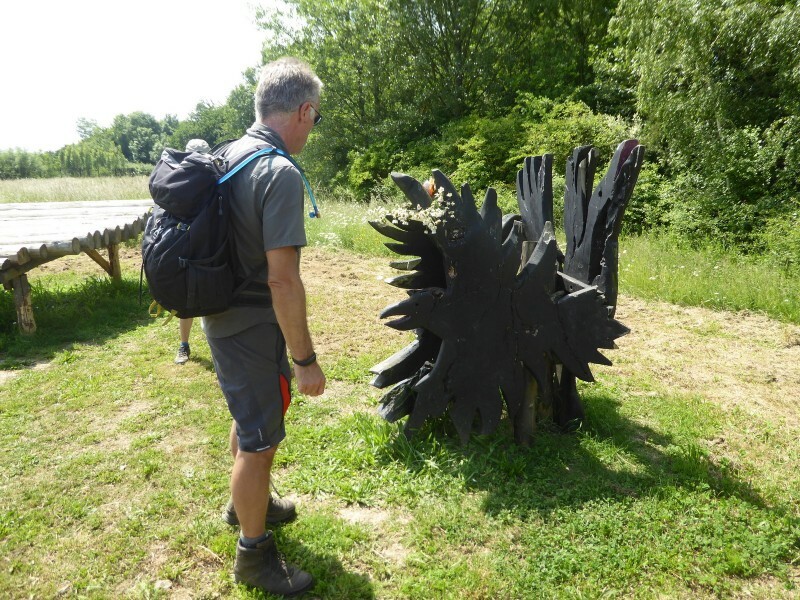 Gail displayed a photo of the impressive sleeve insignia worn by the troops and we then visited the memorials and heritage plaques which mark the site of the camp. 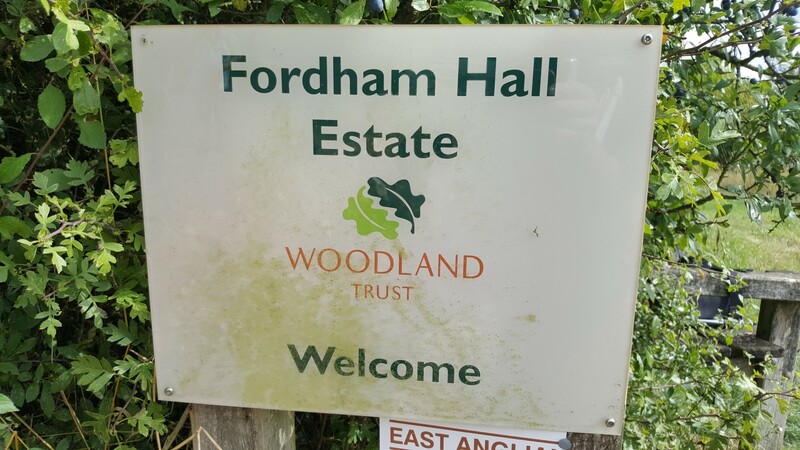 In a reminder of the Cold War we crossed to the Hampton side of the Park to look at the information board on the work of the various research establishments. Leaving the Park at the Lion Gate we returned to Kingston along the Long Walk in Home Park. 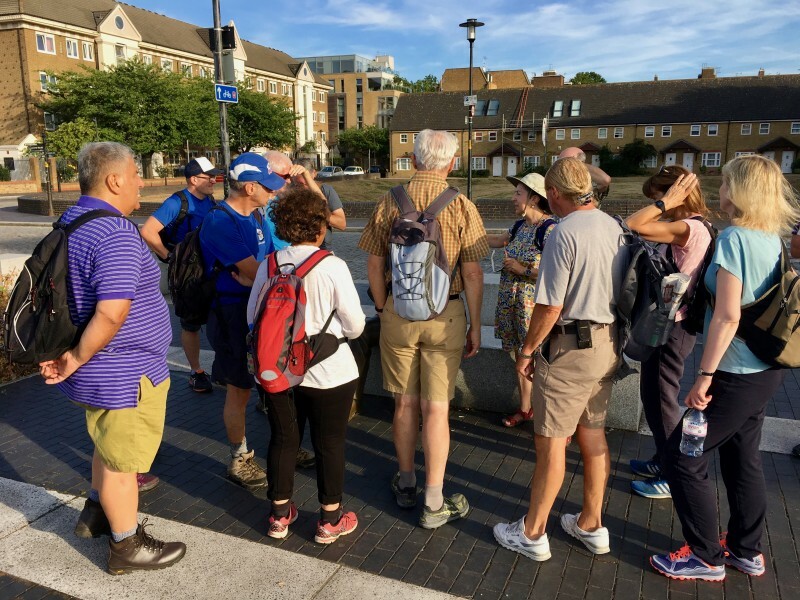 On a glorious summer's evening we set off from Southwark Cathedral to trace the last journey of St. Alfege, from his capture by Vikings, to his martyrdom at their hands in Greenwich. 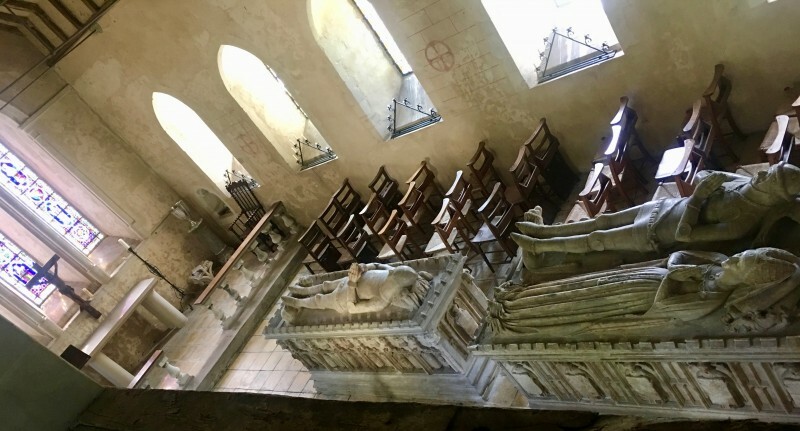 St Alfege was an 11th century Saxon Archbishop of Canterbury who was killed because he would not allow his congregation to pay the substantial ransom demanded by his captors. 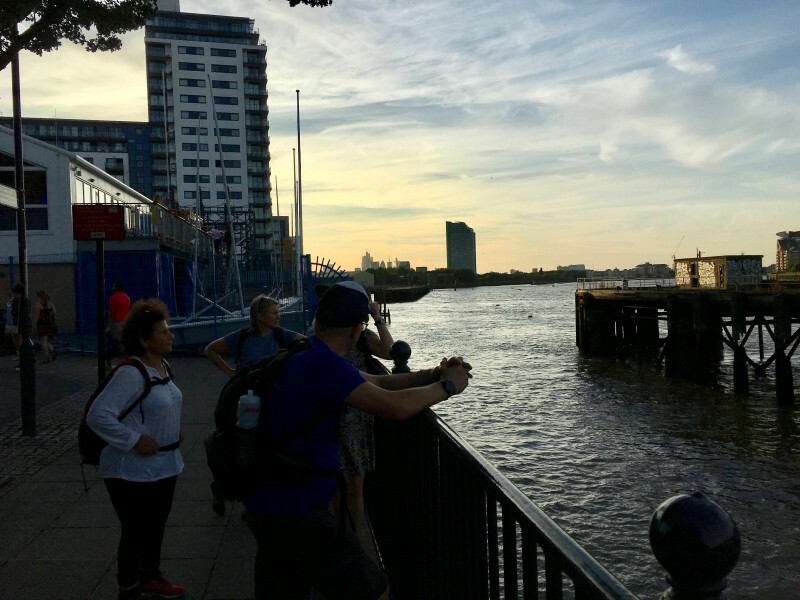 The walk took us eastwards along the Thames, following a combination of the Thames Path and Cycle Network Route 4. 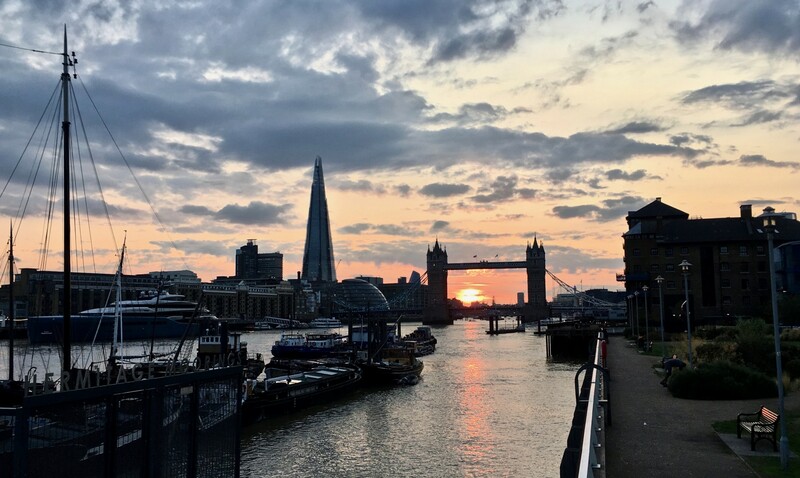 Along the way, we enjoyed the varied and stunning cityscapes that London offers, passing a number of places of historical interest: the Jacob's Island of Dickens' Oliver Twist, Edward III's falconry mansion, the Salter family statues, the Mayflower pub and Brunel museum, Peter the Great's Mulberry Tree and Statue, and finally St. Alfege Church at the end of the trail. 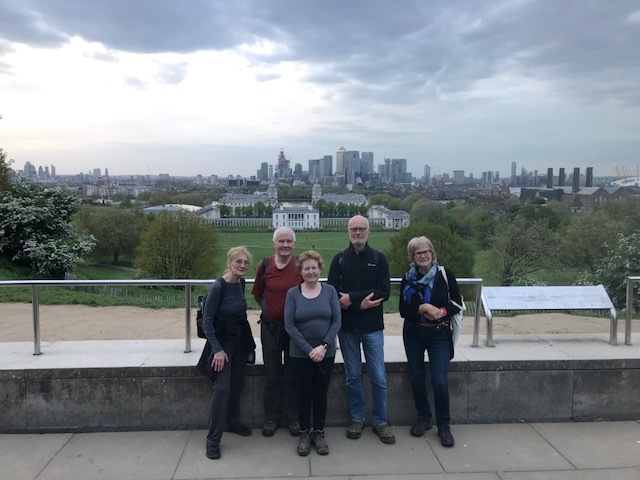 We then went up Greenwich Park to enjoy the view across London by the Wolfe memorial, across Blackheath Common and down into Lewisham to the pot of gold at the end of the rainbow aka the Weatherspoons Watch House. to Seven Sisters. Then the final challenge. exhausting but satisfying and varied walk. On a hot & humid evening 10 hapless souls, (incl. the even more hapless leader !) turned up for my LDWA ( Long Distance Wetherspoons Assoc.) 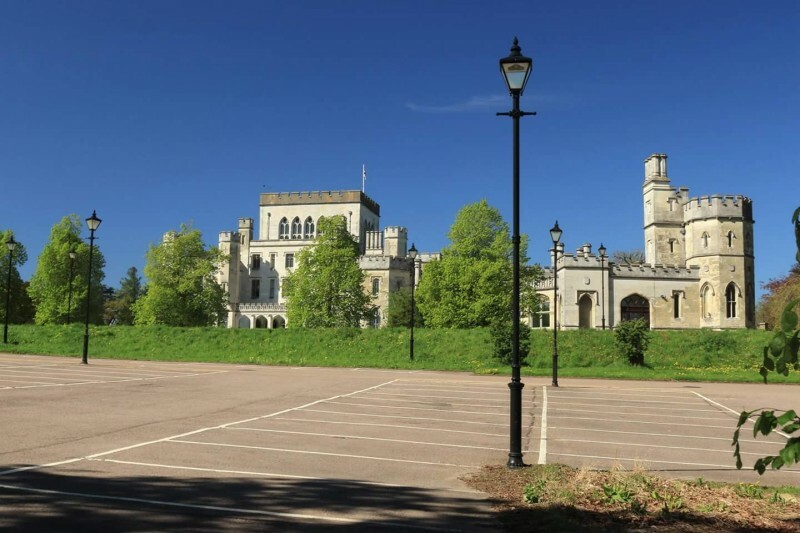 tour of 15 of their finest establishments. We made our way serenely thru' the City before adjourning at 'The Sir John Oldfield ', no.7 on the list, for a rehydration break ! It was at this point that 20% of our complement abandoned , inc.1 intrepid soul who had flown over 12,000 miles just to be part of this auspicious occasion, real dedication to the cause ! 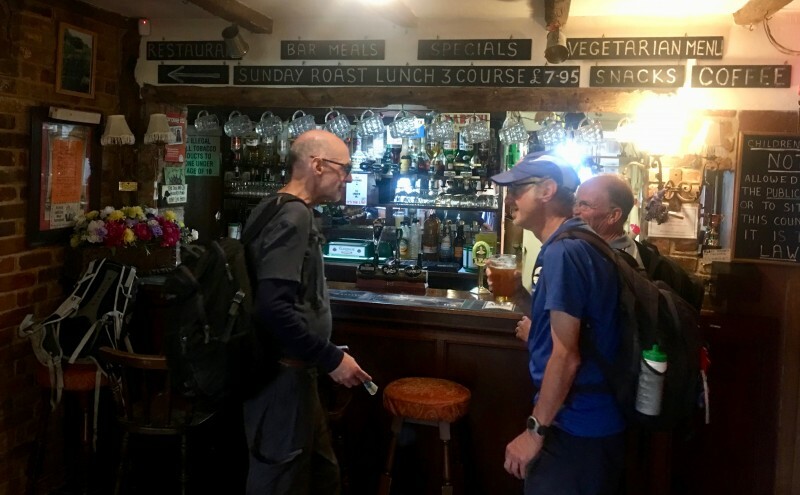 We made light of the remaining 8 W'spoons eventually reaching our goal, ' The Willow Walk ' at Victoria where we all piled in to partake of some more rehydration !!. 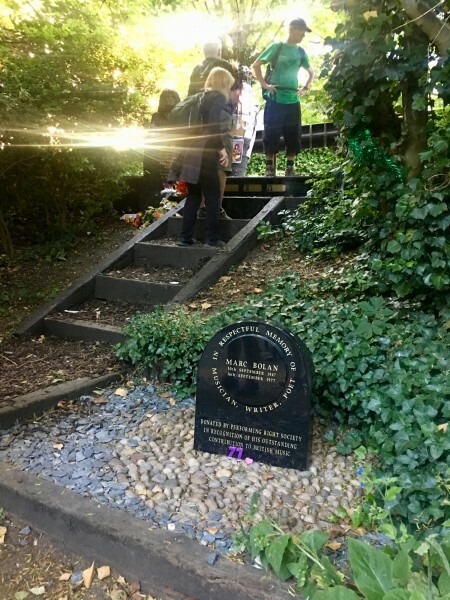 This was a special walk, because it was the 54th anniversary of the death of Rob’s father, John White, known as the Ghost of White Hart Lane and a member of the Spurs Double-winning side of 1960-61. 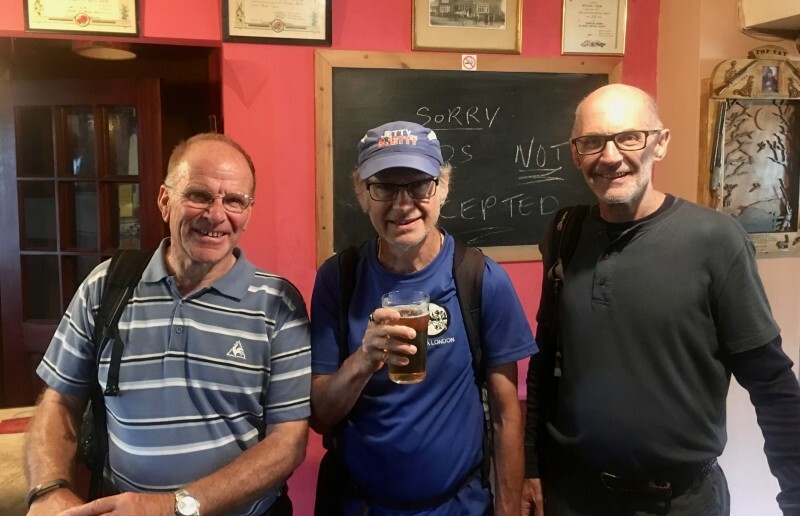 John was killed by lightning on Crews Hill golf course while sheltering under a tree on Crews Hill golf course, and we stopped there to pay our respects at his memorial plaque by the 9th hole. 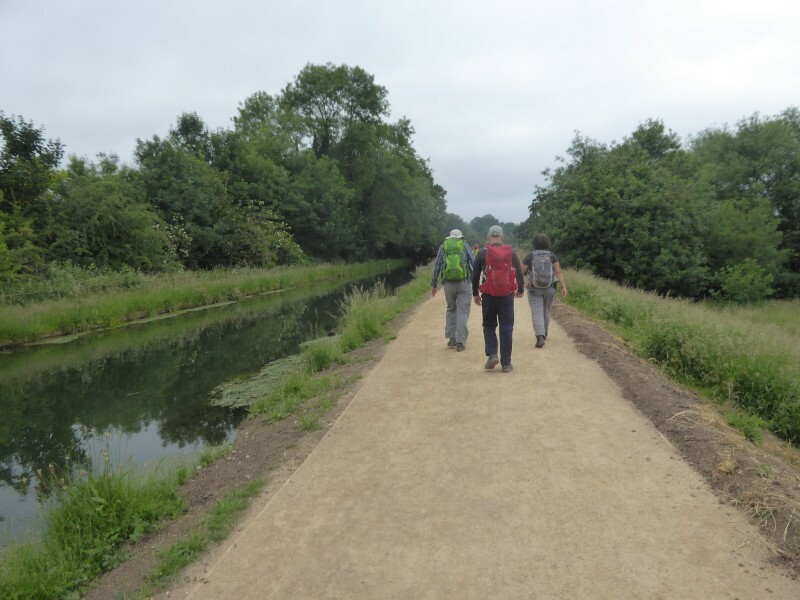 The first half of the route took us from Tottenham Hale via the Lea Valley Walk to Cheshunt. By this time we had lost two walkers. 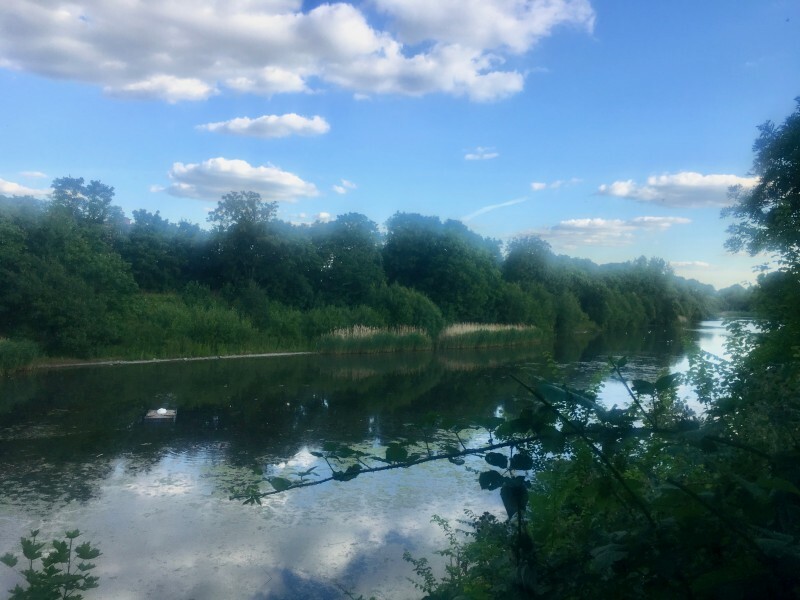 One was injured within the first two miles and had to be nursed very slowly to Enfield Lock, where he could access transport home. 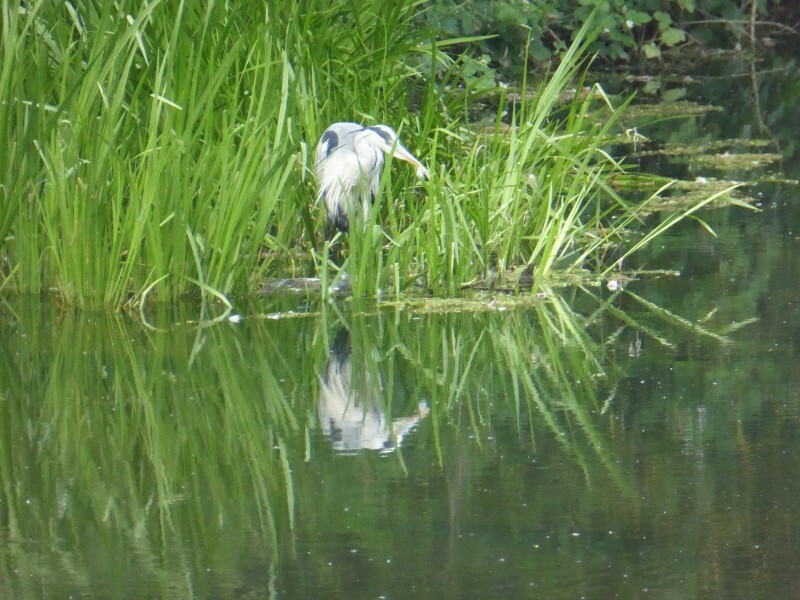 The other escapee sped off into the distance and was last heard of at Waltham Lock. 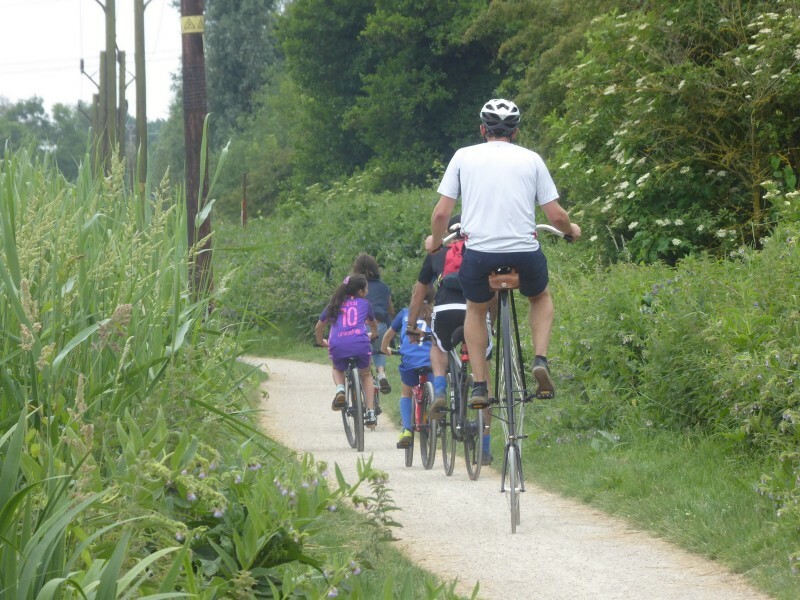 After Cheshunt we followed the New River Path to Hotspur Way – Spurs fantastic training ground – and made our brief stop at Crews Hill before finding our way back via the more attractive parts of Enfield and then Edmonton. Soon we saw the top of the cranes that have dominated this part of North London since the end of the 2016-17 football season, and after a trek along Pretoria Road Spurs’ magnificent new stadium was before us. We were in glorious sunshine all the way, and never were so many ice creams eaten in the course of one walk, most of them by the leader. There were 13 of us, it was a 7 mile walk through Belair Park, onto Dulwich Park out and up through Cox's walk, past the bridge where Pisarro did his painting of Lordship Lane Station, through Sydenham Hill Woods, along to Horniman's where we had a brief stop for loo and view, out and past Mrs.Jordan's house where she entertained William IV, along and down to Brenchley Gardens, into Honor Oak nature reserve, up One Tree Hill for another view-stop by the Great War gun emplacement, a nod to the Oak of Honour before heading down past Honor Oak station, on up Blythe Hill and then the shortest route down to Ladywell Fields and the Ladywell Tavern. 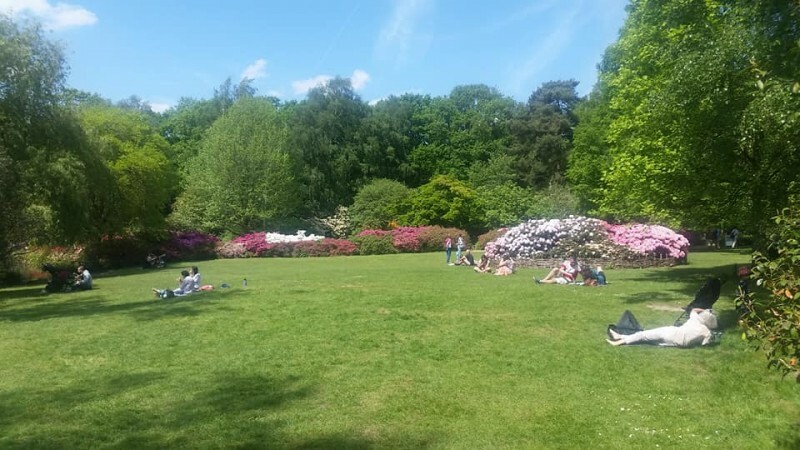 (Beer,sooner rather than later was the preferred option, otherwise we would have done one more hill and gone up Hilly Fields.) 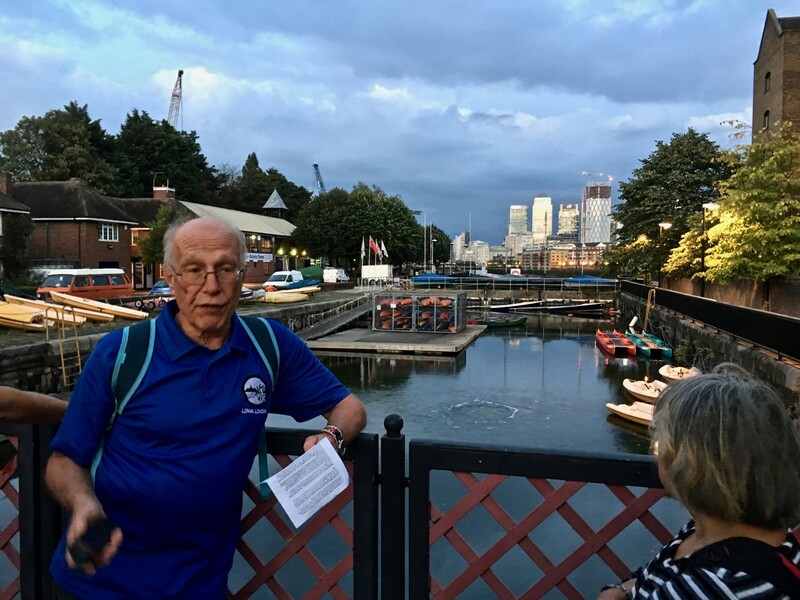 Dave wanted to try the Fox and Firkin, but everyone else wanted the nearest pub, so we headed to the Ladywell Tavern and sat outside, enjoying a cold beer on a warm evening. 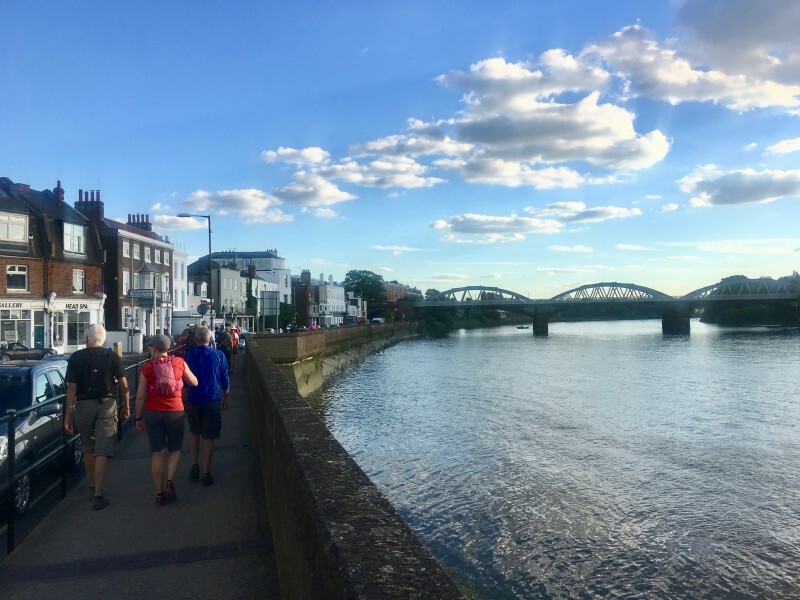 I gather my pace was a bit Blackheathy, but this is the first LDWA evening walk I've been on, so I need to adjust to a different culture. Anyway, everyone was lovely, and warmly appreciative. 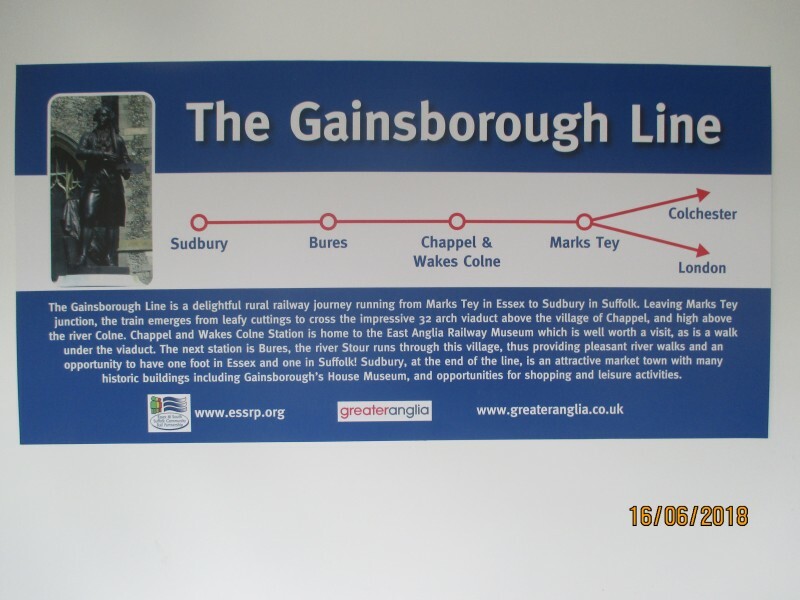 There were transport problems that evening - signalling failure and cancellations. 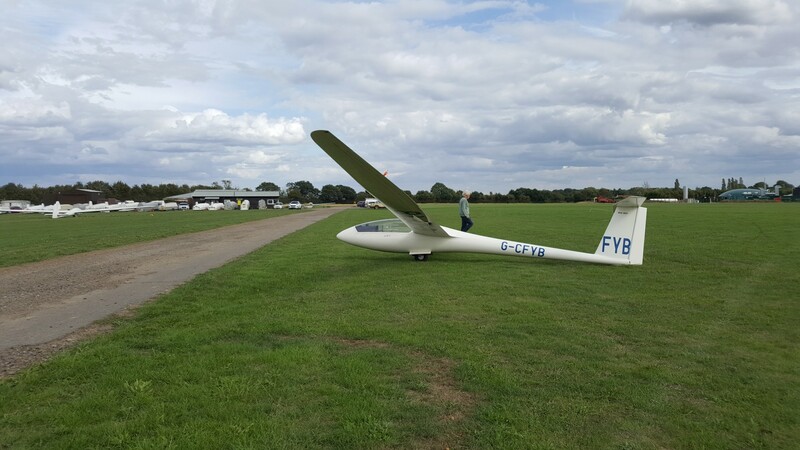 Some only just made it, so possibly some were unable to get there on time. She occasionally received by SMS. 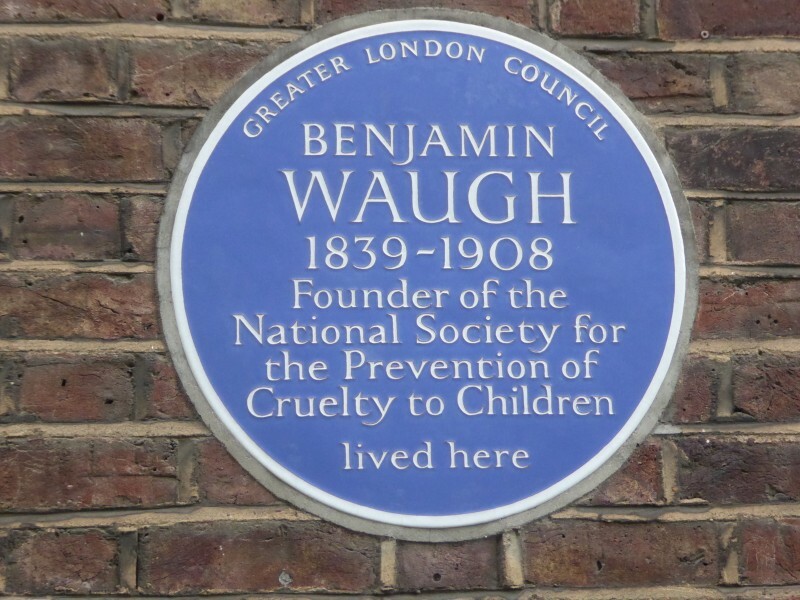 Raynes Park, Bushey Mead playing fields, tour of Cannon hill with a plaque giving details of the historic house owned by the richest man of Victorian times who left a fortune of 3 million pounds. 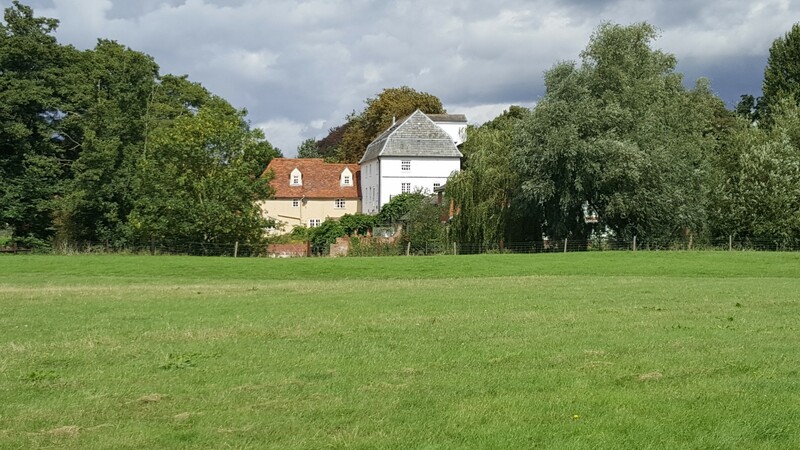 An ancient hollow but still alive oak tree, a lake then on to Morden park for more recent history and a full frontal view of one of the largest mosques in Western Europe. 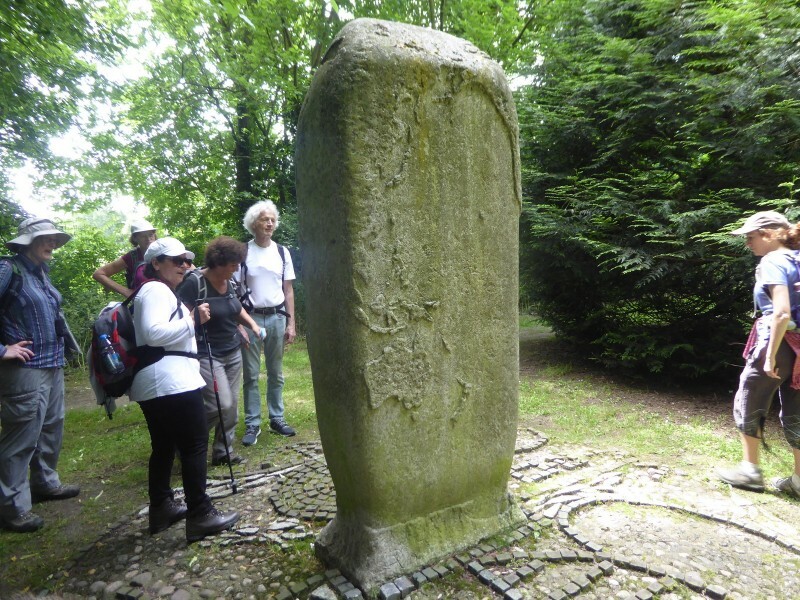 Tour of park and its tumulus then passing the grandiose Morden cemetery and the pretentious residential area of Worcester park, which lead to the London Loop at Cuddington church and this was followed to the revised finish point of Berrylands pub and station. 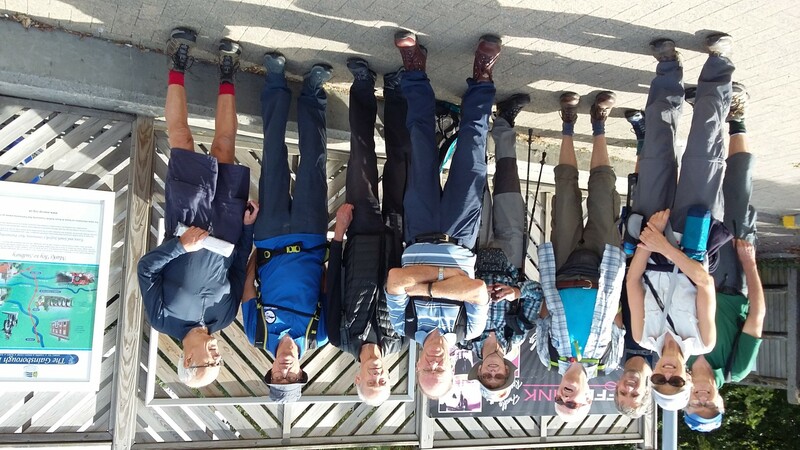 Six of the best from a few days ago where reduced to the Famous Five who came prepared to face the little used footpaths in this part of Essex. 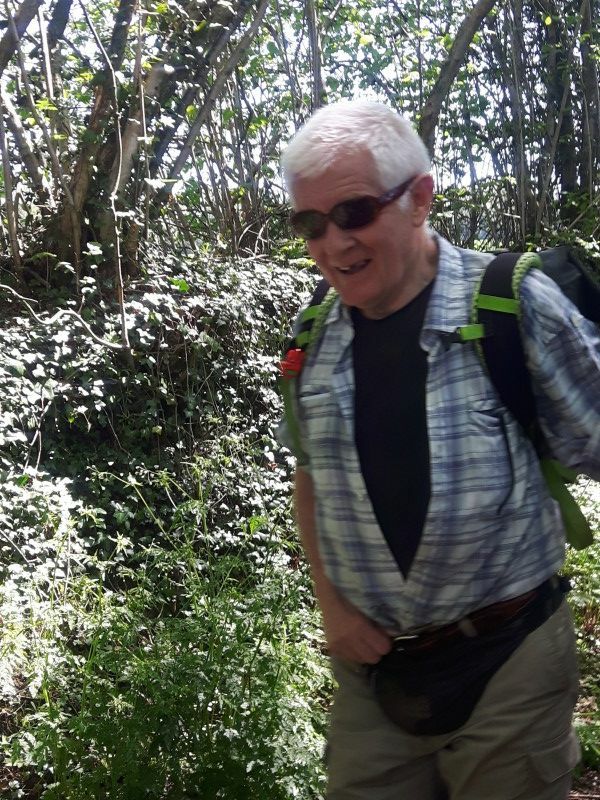 Bare legs and knobbly knees were the order of the day, just right to crash through the undergrowth and beat the nettles into submission. An unplanned extra stop at a local hostelry did wonders for morale, and ensured that the expedition was completed successfully. Boy it was hot! and hay fever came on really bad. No pictures this time as we must maintain secrecy but suffice to say one member became extremely excited when our objective was revealed as the local Wetherspoon and another used the opportunity to continue training in the art of the slope. 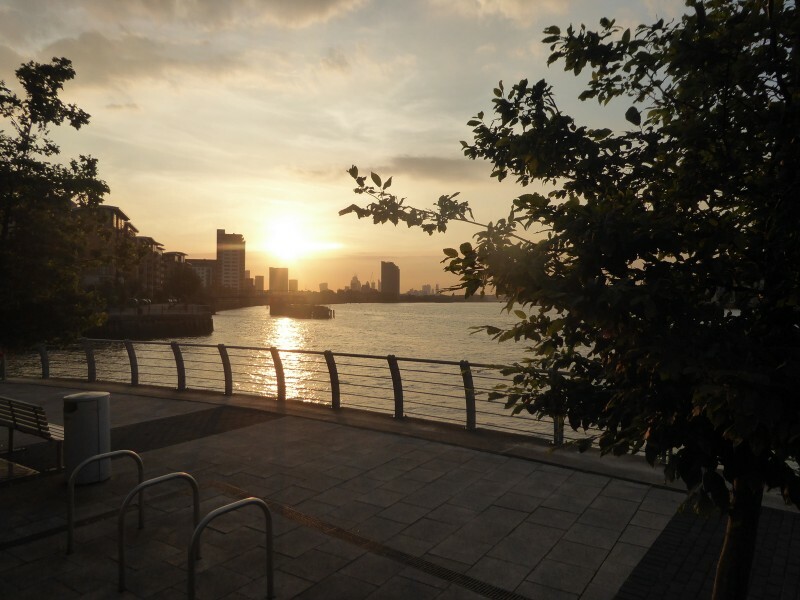 9 of us set off from North Greenwich station at sunrise, 4.43 a.m., the object of the exercise being to get as far as we could along the Thames Path by sunset (21.22). 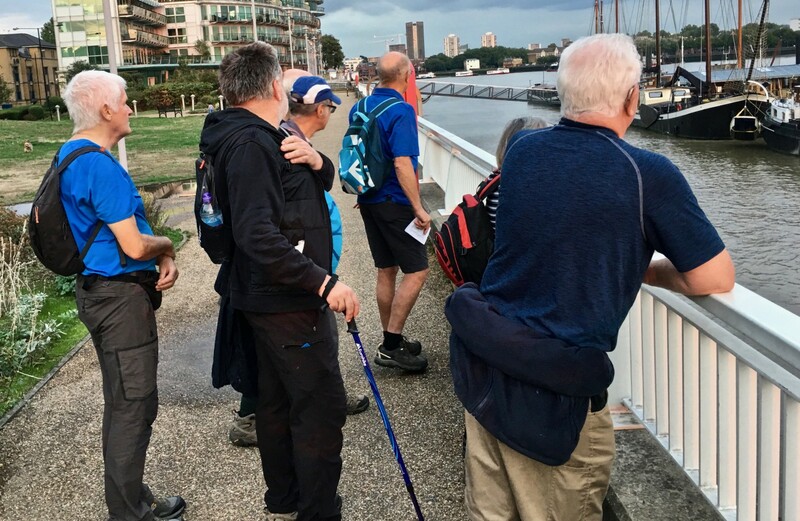 Another walker joined us at our breakfast stop, the Lord Moon at Whitehall, another at Battersea Bridge and another at our lunch stop at Kew Green. 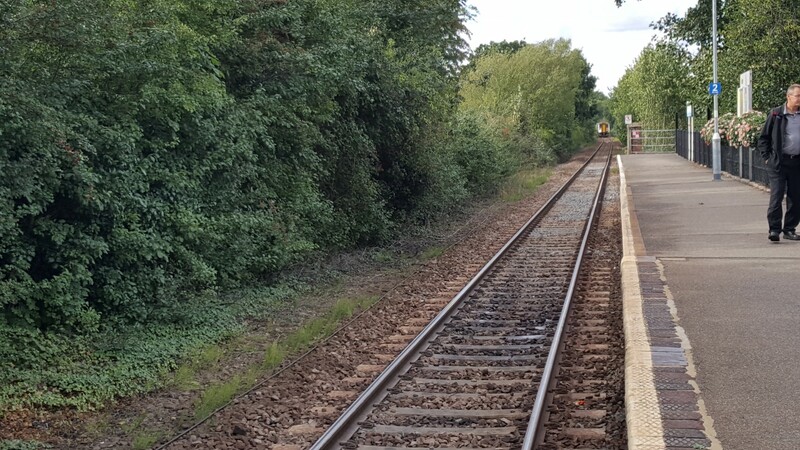 We also said goodbye to one at Barnes Bridge and our Kew Green joiner hopped on a train at Hampton. 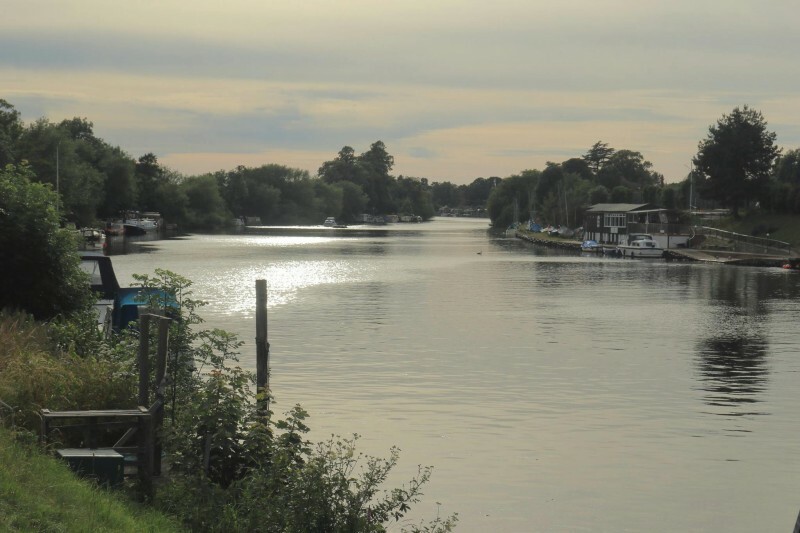 Eight of us reached the Minnow at Weybridge (40 miles) a good hour and a half before sunset, but none were incentivised to plough on in the gloaming so we said goodbye to the Thames Path (beautiful and sun-kissed all day) and made for the back of beyond, otherwise known as Weybridge Station, a rather grim 2-mile uphill trudge. 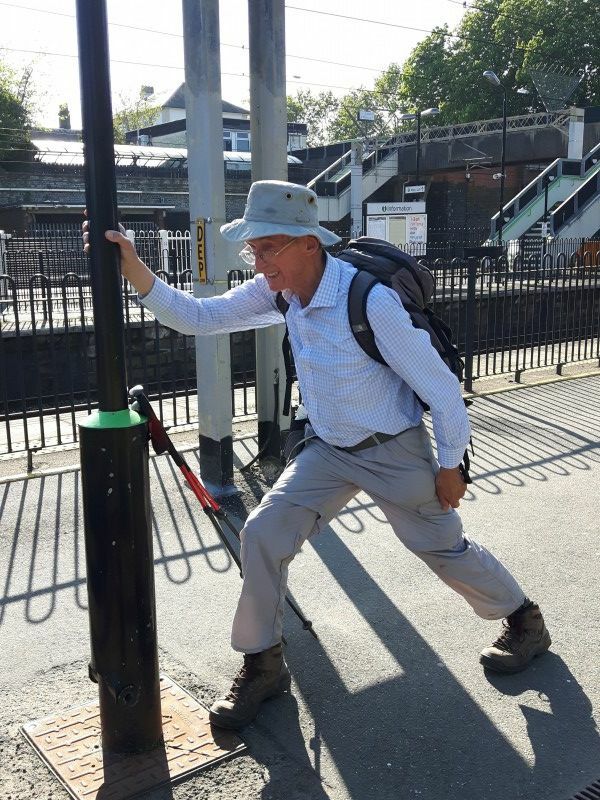 Colin, creator of this lovely and very social walk but unable to take part this year because of injury, tracked us all the way via public transport and was waiting at the end with our well-earned certificates. 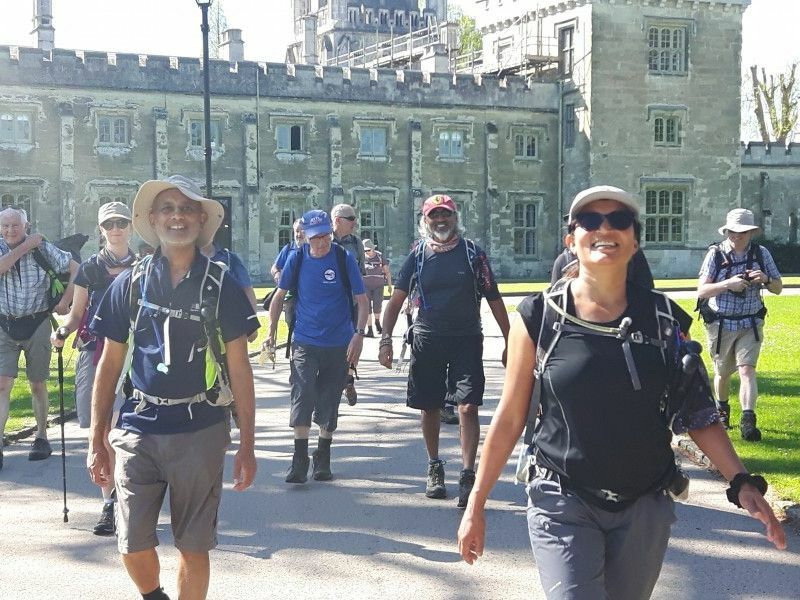 We took it at a very leisurely pace to enjoy all the sights and sounds but anybody who really wanted to belt along could well have reached Windsor (57 miles) before cut-off time. A challenge for next year, maybe. 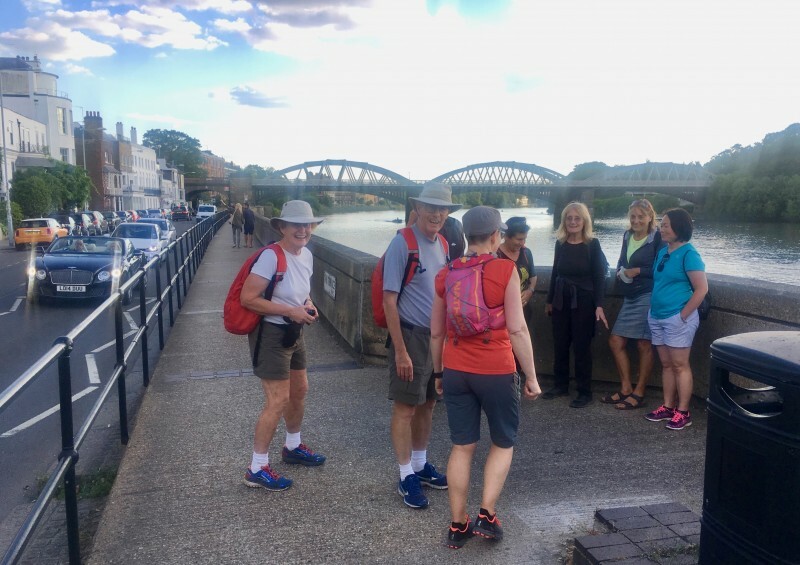 Thirteen people met at Putney Bridge Station. 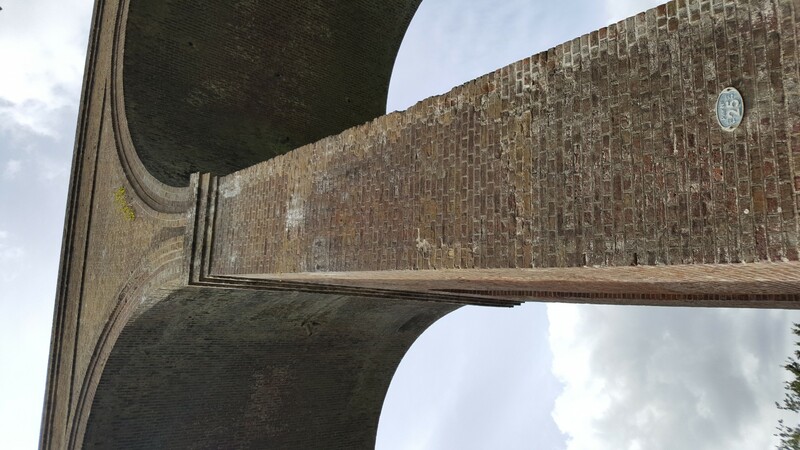 Having crossed the footbridge over the river we continued on the towpath, stopping to look at the monument to Steve Fairburn, the founder of the Head of the River Race. 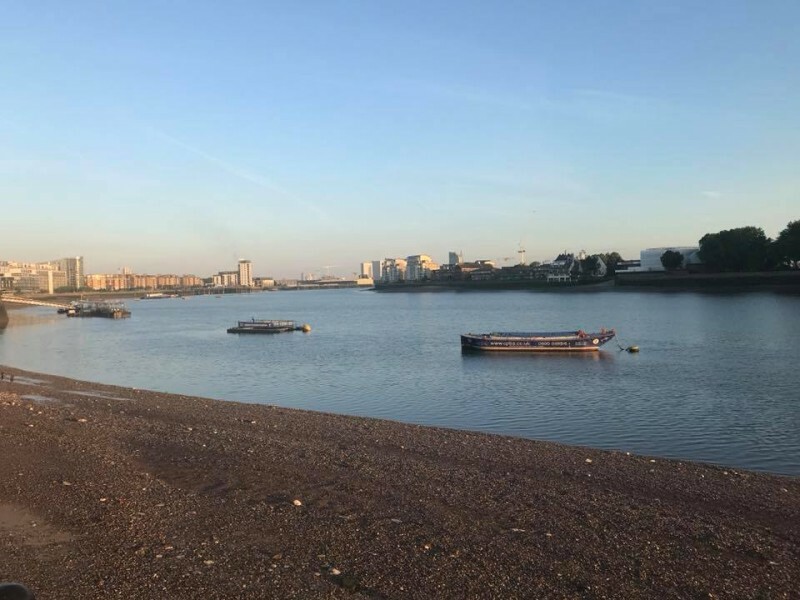 The race is rowed from Mortlake to Putney (i.e. 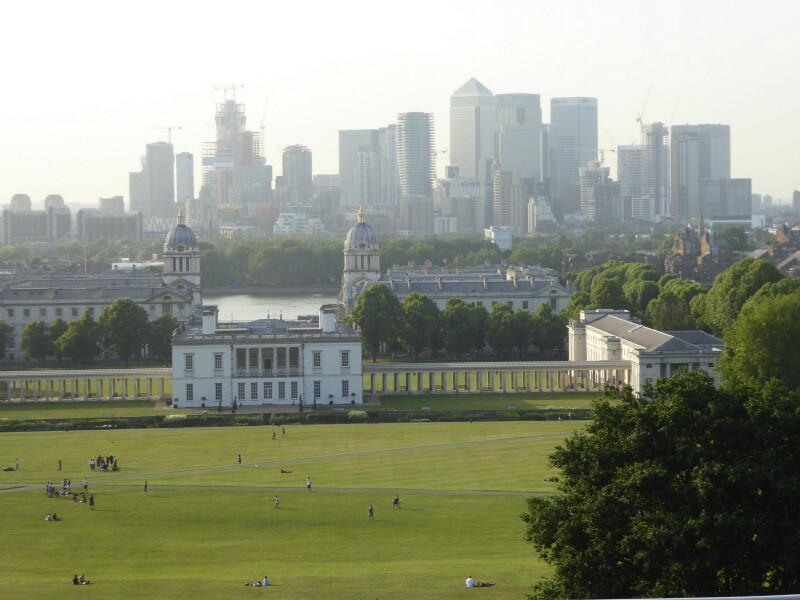 the Boat Race course in reverse) and is usually held on the third or fourth Saturday in March, depending on the tides. 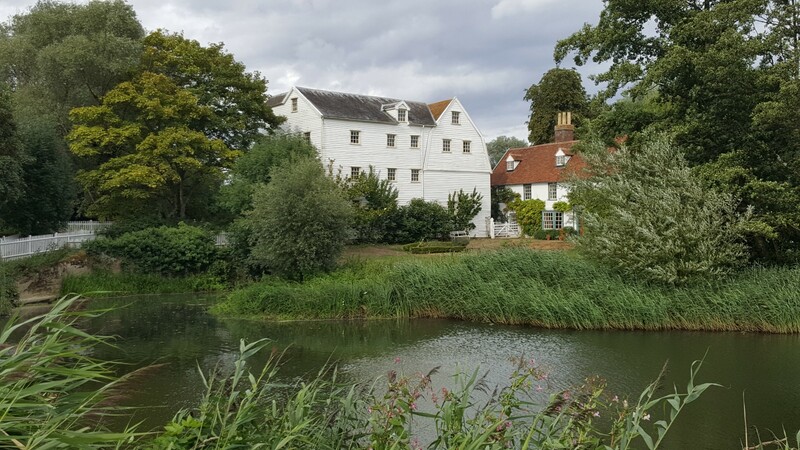 We left the towpath to walk alongside the Barnes Nature Reserve and then followed the Barnes Trail through the village. 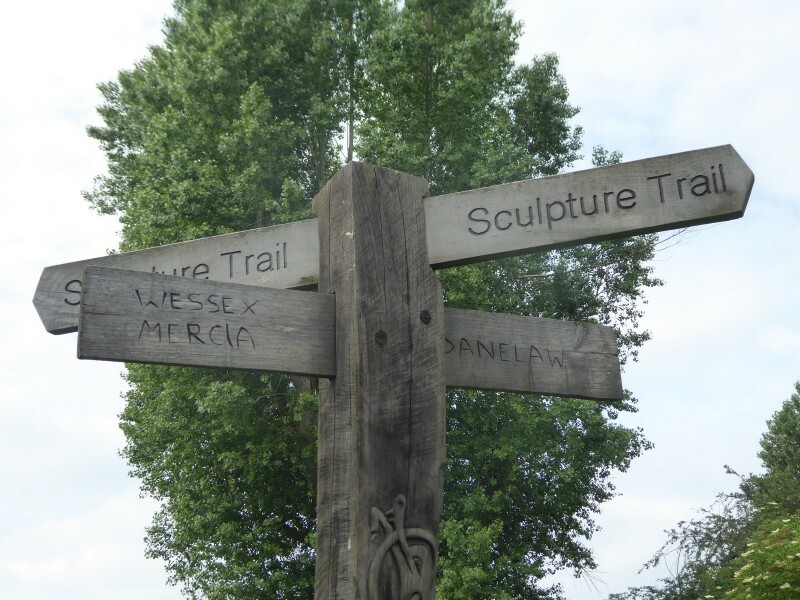 The Trail is marked by metal oars which carry information about the local area. 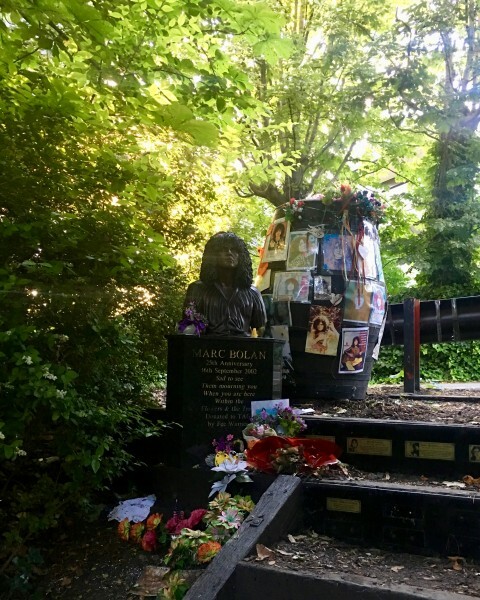 At Barnes Green we stopped by the pond and then headed over towards Barnes Common to view the Marc Bolan Shrine. This marks the spot where the pop star was killed in a car crash in 1977 at the age of 29. 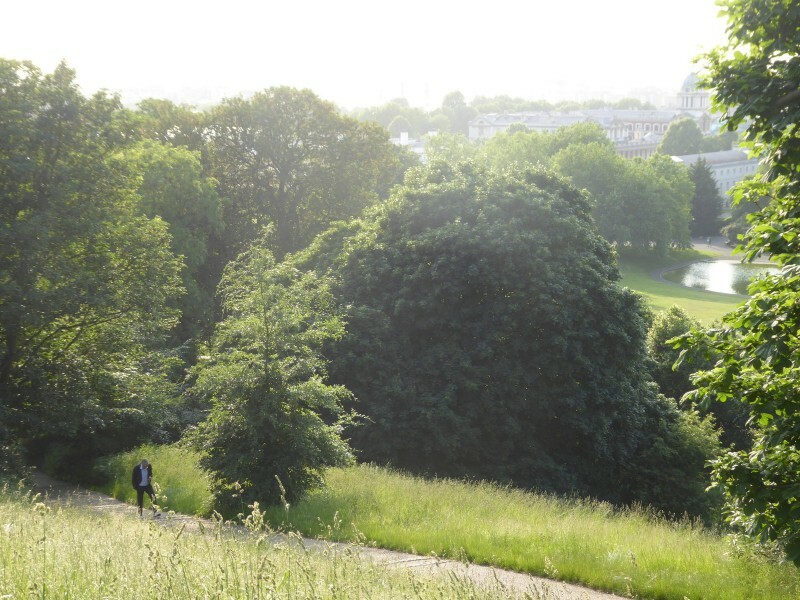 We continued on to Putney Lower Common which looked very rural with the long grass and bright evening sunshine. 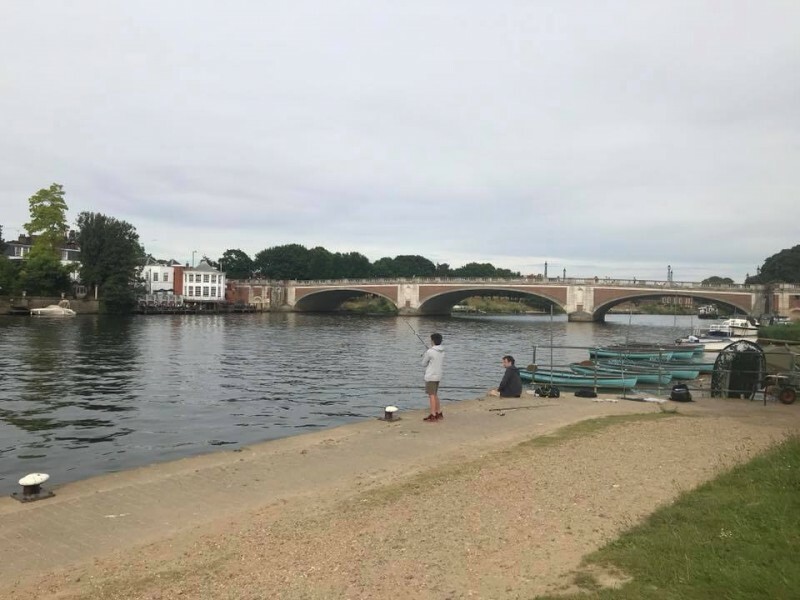 The path took us back to the river and Putney Bridge. A Midsummer Day's walk blessed with fine weather. Everyone deserved their drink at the nearby Wetherspoon! 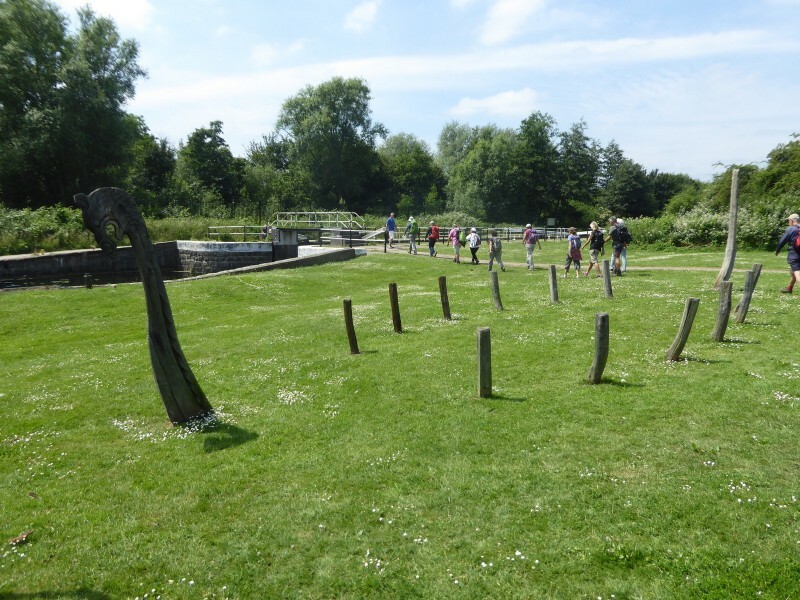 A circular walk East of Bures then a linear walk following the Stour Valley Path to Sudbury. 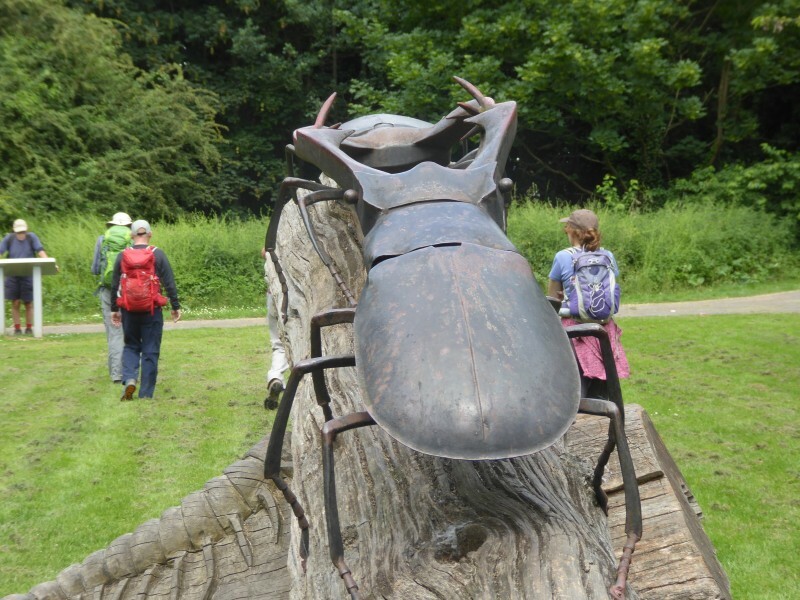 An opportunity for those wanting a shorter walk to return from Bures at 12 miles. Bring own food and water, only one opportunity on route to purchase refreshments. - Wissington Church A Norman church which is half a mile from its village which in turn is on a lane not particularly on the way to anywhere. 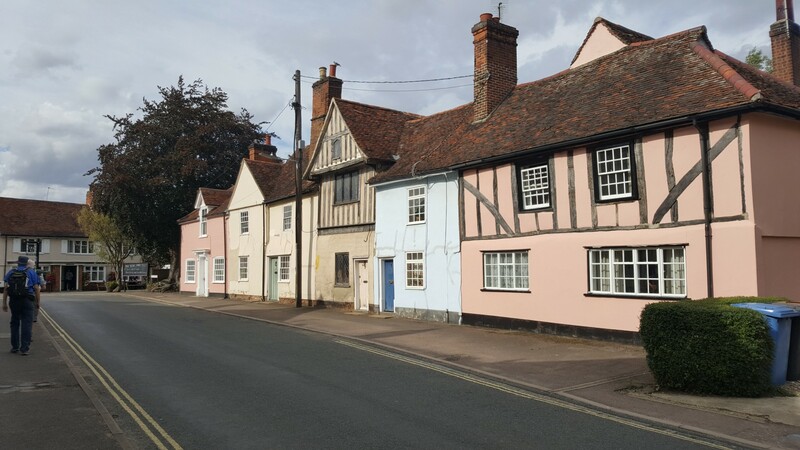 - The Beehive Pub at Little Horkesley (coffee served in cups at £1 per cup) guess whose turn it was to buy? 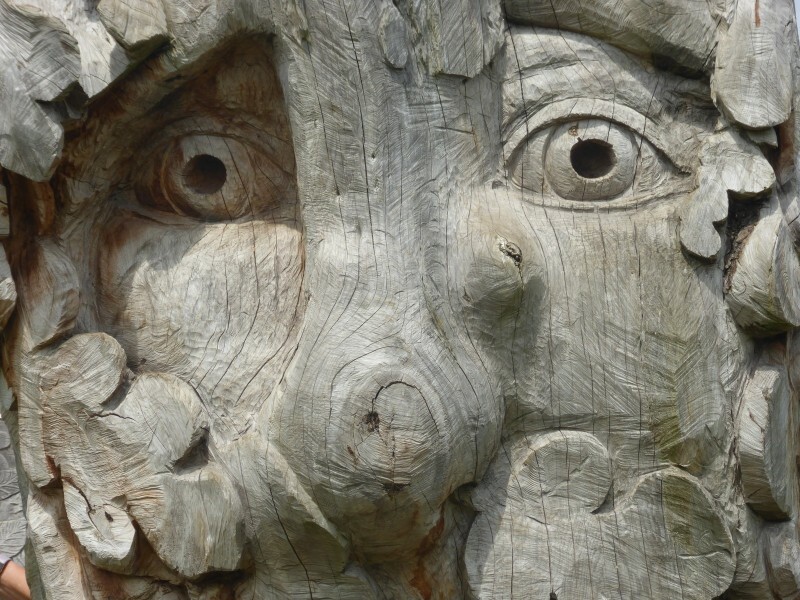 If you know of a cheaper place let me know and it will feature in a future walk especially if the landlady is older than 85. 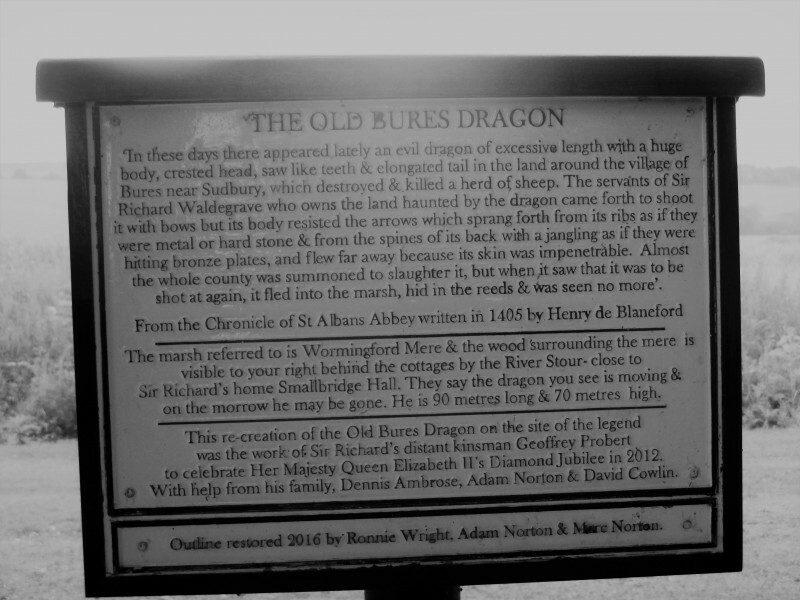 With a break for lunch in comparatively busting Bures it was no surprise that we reached our destination of Sudbury some 30 mins. 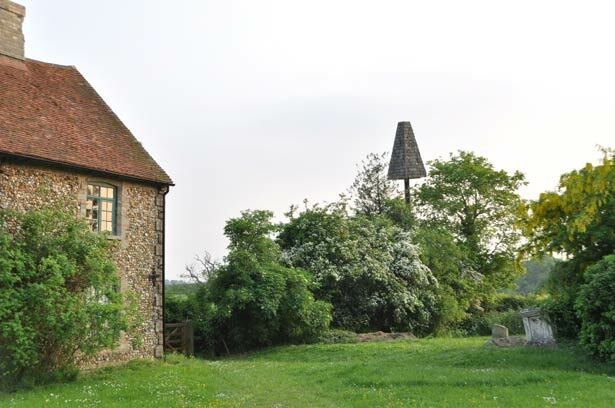 late, but we were now in Suffolk so no hurry, no worry. 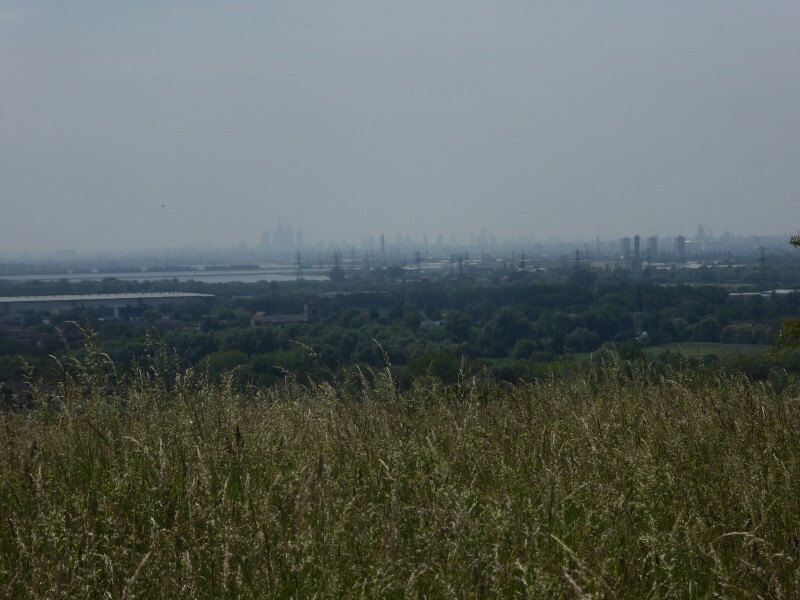 13 people joined me - along the New River, then the canal, then country park, woods and the ridge - a great view of London then down to Waltham Abbey. 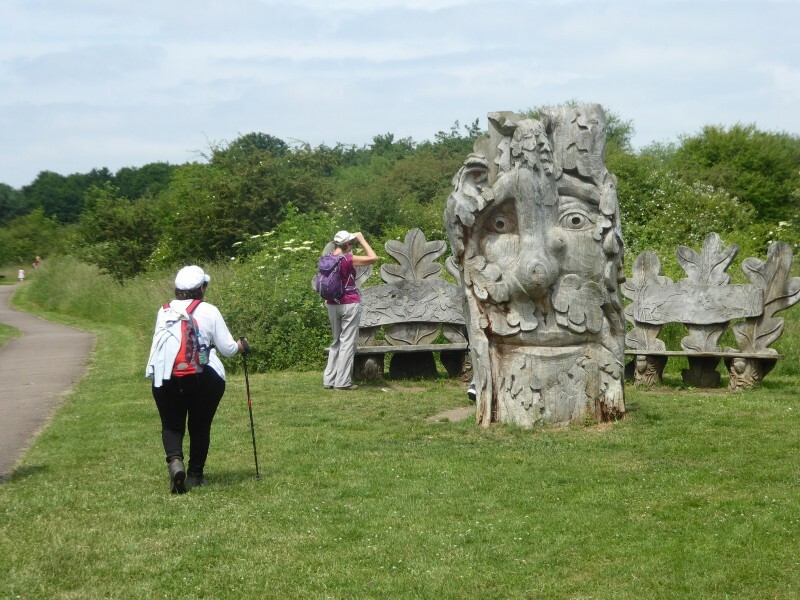 It was the sculpture trail after lunch and more canals and paths round the gravel pits lush with water, birds and greenery. A bare 19 miles - and with quick trains home early. 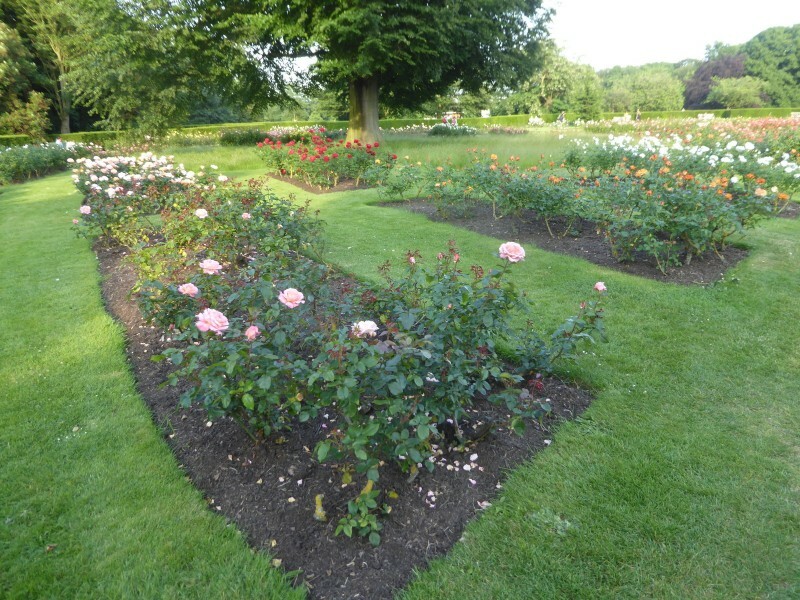 A lovely summer evening and 15 of us in total walked the length and breadth of Greenwich Park which was looking lovely with all the flowers out....including the roses. 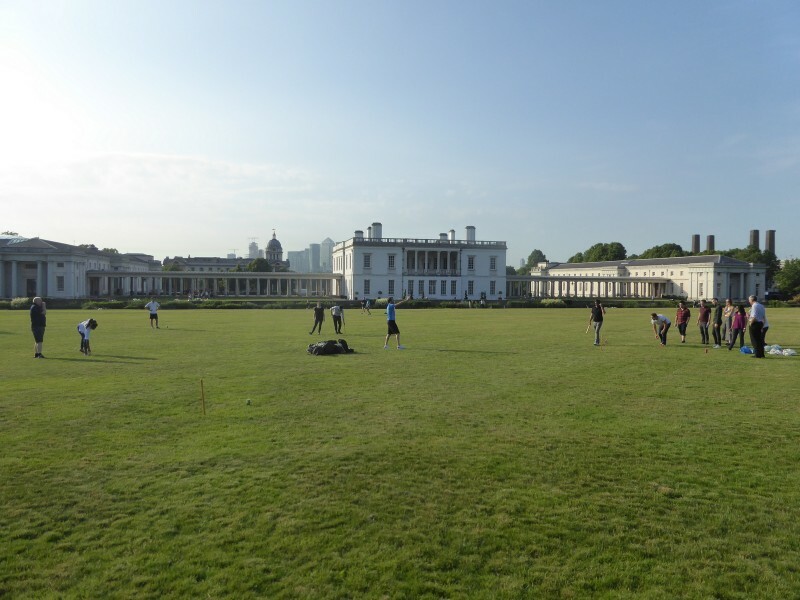 Then around Blackheath's heath and a short stretch along the river at the end before we partook of refreshment in ?? yes you've guessed - a Wetherspoons. 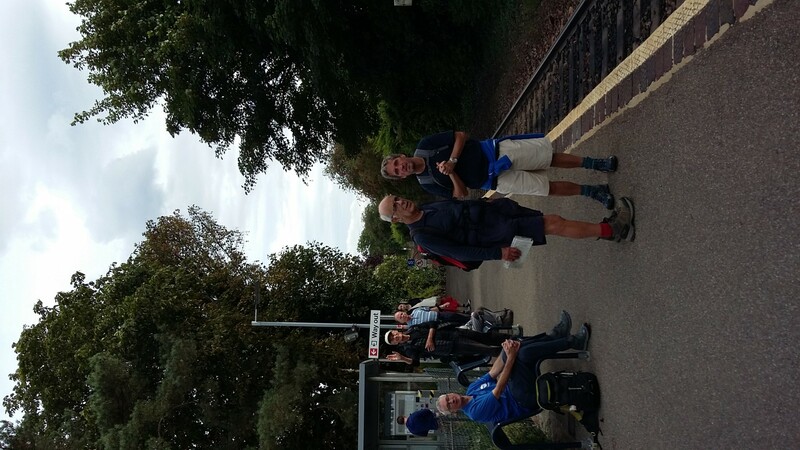 Fourteen walkers arrived at Twickenham Station on trains crowded with Rugby supporters, many in fancy dress, on their way to the Sevens tournament at HQ. 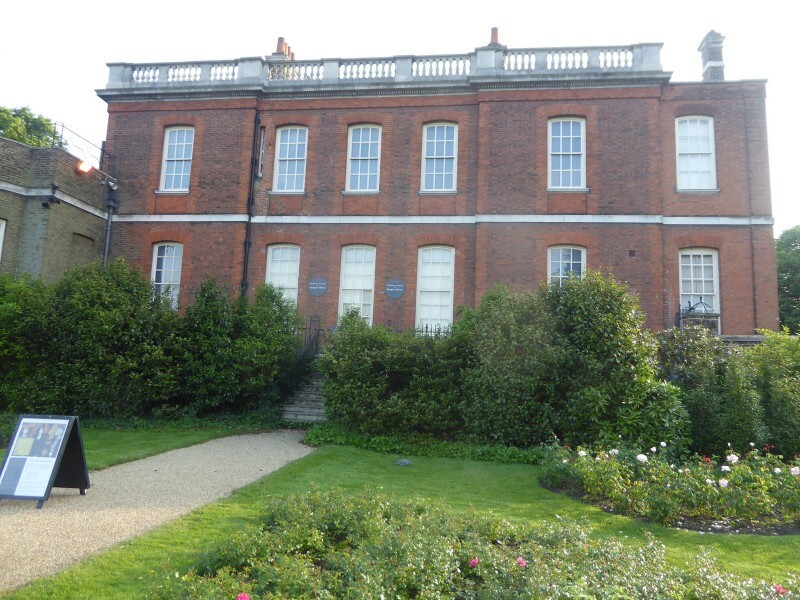 We headed in the opposite direction for the River, to Eel Pie Island, and then in to York House Gardens and “The Naked Ladies” after a group photo we headed for Marble Hill Park and along the Thames Path to Richmond Bridge and back along the Thames Path on the opposite side before turning off by Ham House. 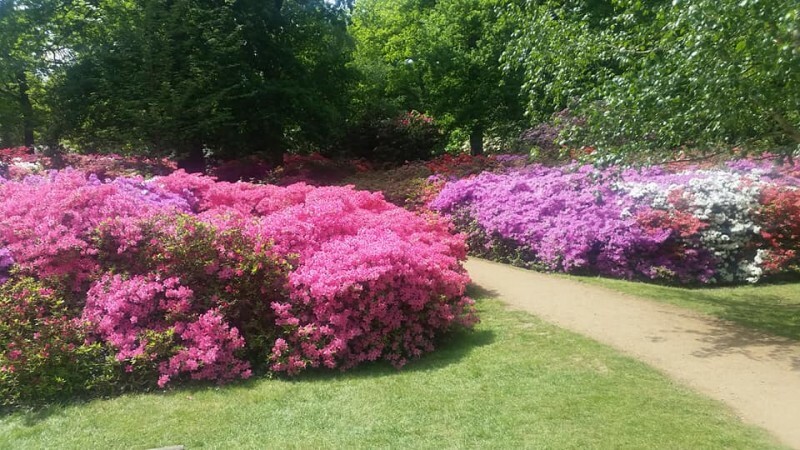 We entered Richmond Park at Ham Gate and followed the Tamsin Trail to Robin Hood Gate where we joined the Beverley Brook Trail through Palewell Common, Barnes Common and Lower Putney Common to the River in Putney and to our lunch break. After lunch we continued along the River to a sunny and very busy Battersea Park. 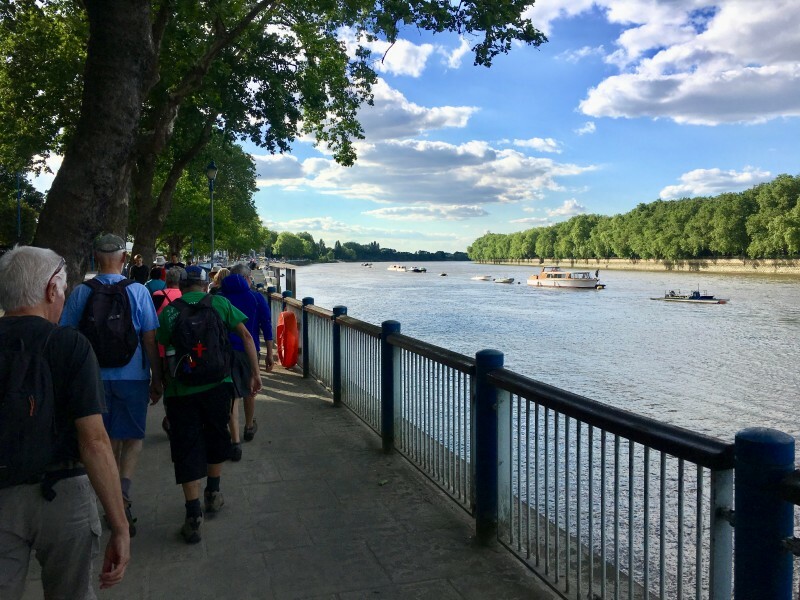 We crossed Chelsea Bridge and then walked through Pimlico to Horse Guards Parade and finished the walk 4:15pm at the Lord Moon Of The Mall where one of the Guest Ales was coincidently Twickenham Breweries Naked Ladies Golden Ale. 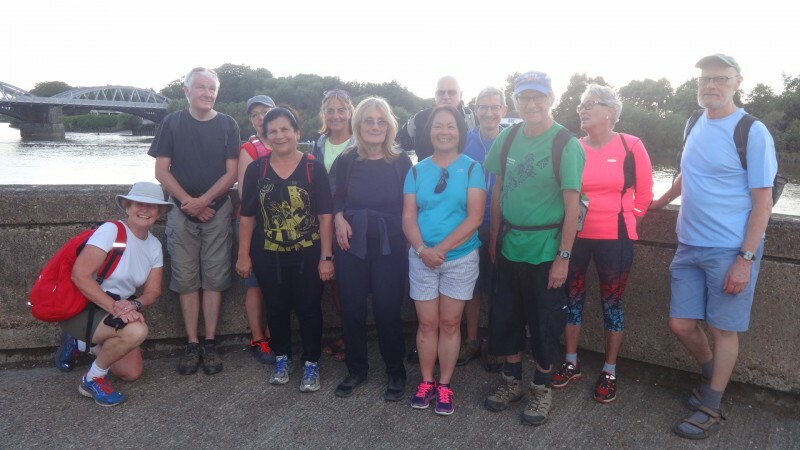 Ten walkers and one dog enjoyed the walk across Barnes Common to the Thames and then the walk on the towpath to Richmond. 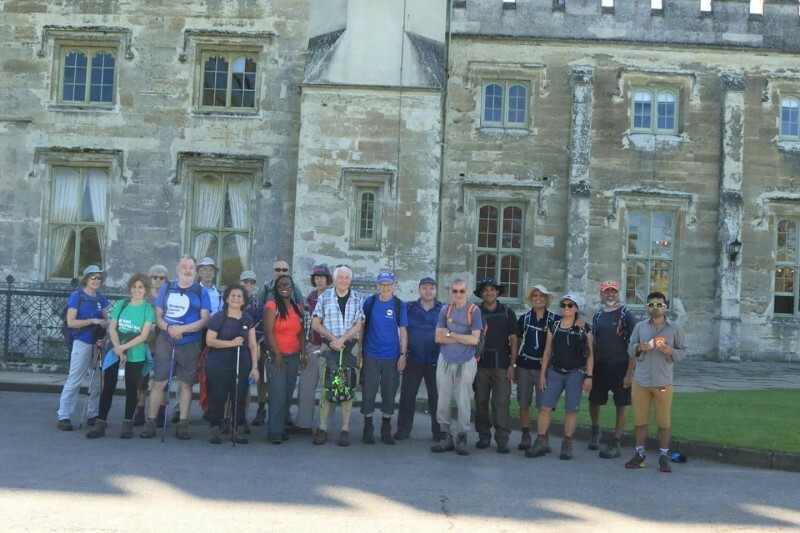 Among the ten walkers were three new members who were especially welcome. 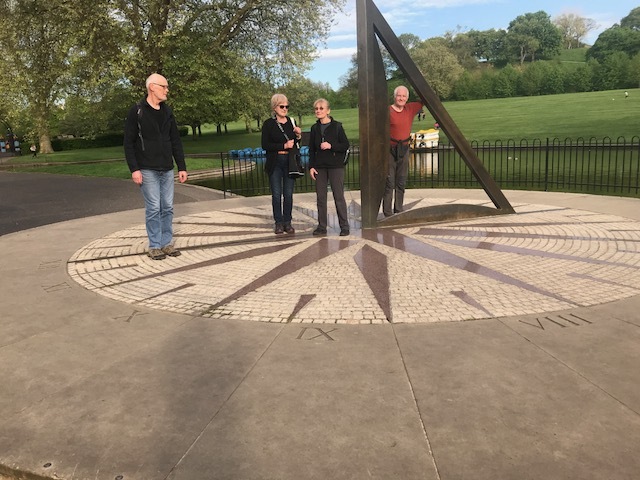 During the evening, the walkers managed to cross from the Eastern Hemisphere to the Western Hemisphere and back again or, at least, they would have had the walk been 200 years ago when the meridian line ran through the Old Deer Park in Richmond, before it moved to Greenwich. To end the evening, a few drinks were had in a pub on Richmond Green." 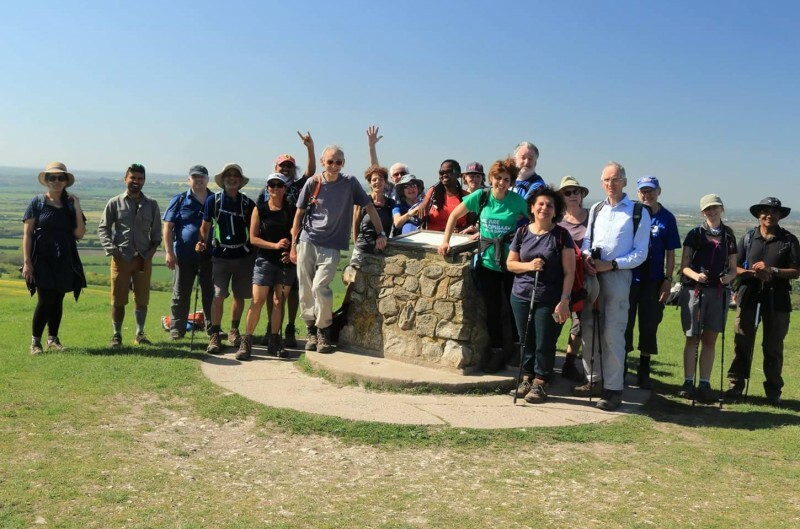 Thirteen people resisted the attractions of the Cinque Ports 100 and the beach on a Bank Holiday weekend to assemble at Guildford Station for a 22 mile walk in the Surrey Hills. 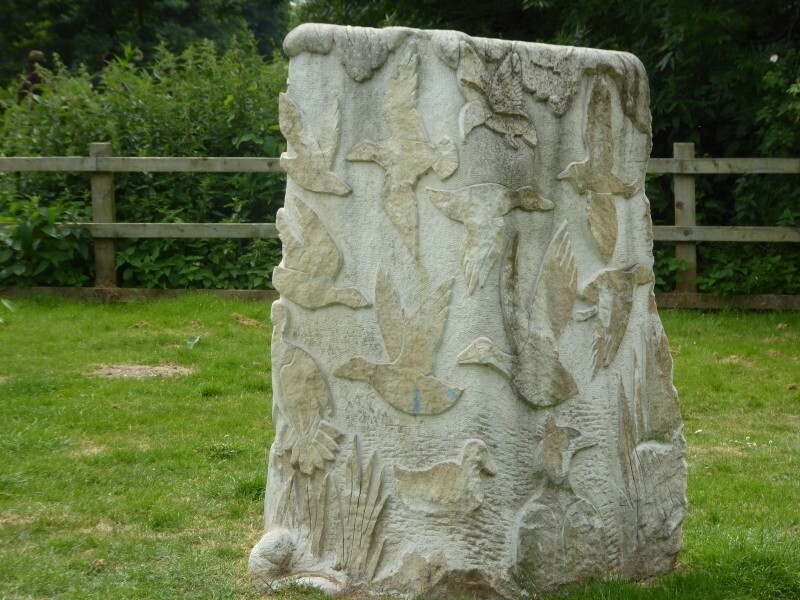 We set out along the Wey before going through Shalford and climbing Chinthurst Hill. 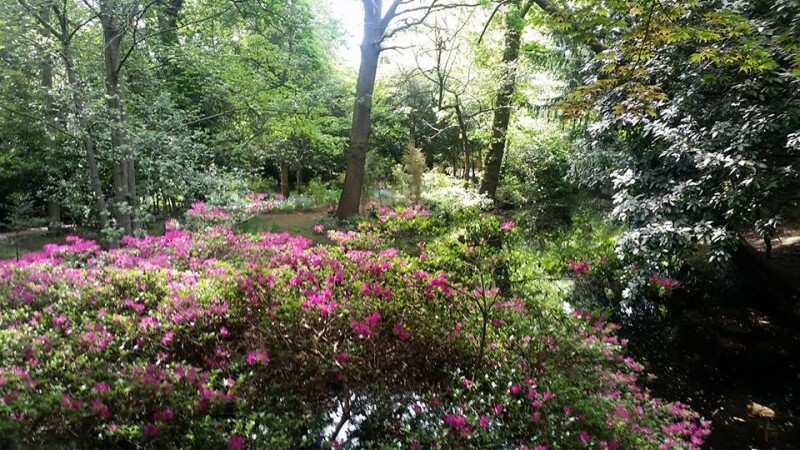 We continued through Bramley to climb up through Winkworth Arboretum with the azaleas in full bloom. 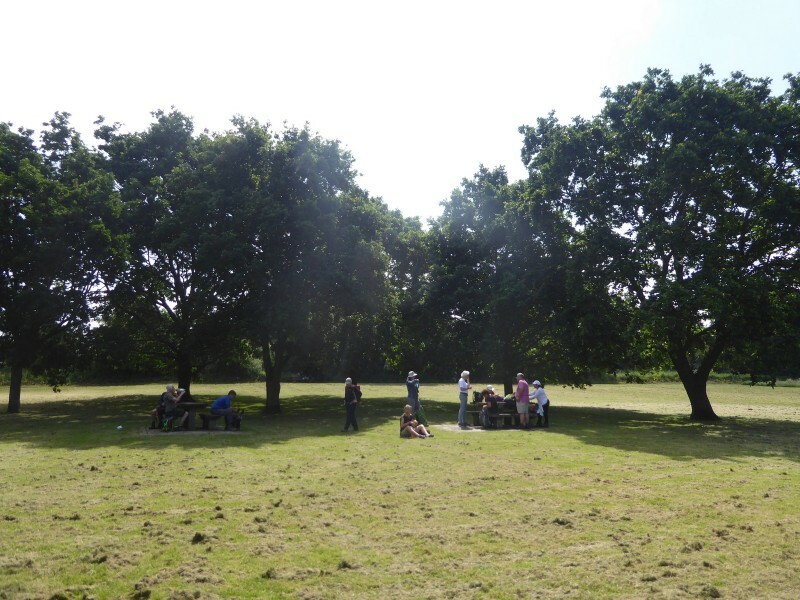 Next we went across the slopes of Hydon's Ball to a welcome late lunch stop in the White Horse at Hascombe and/or a picnic by the pond. 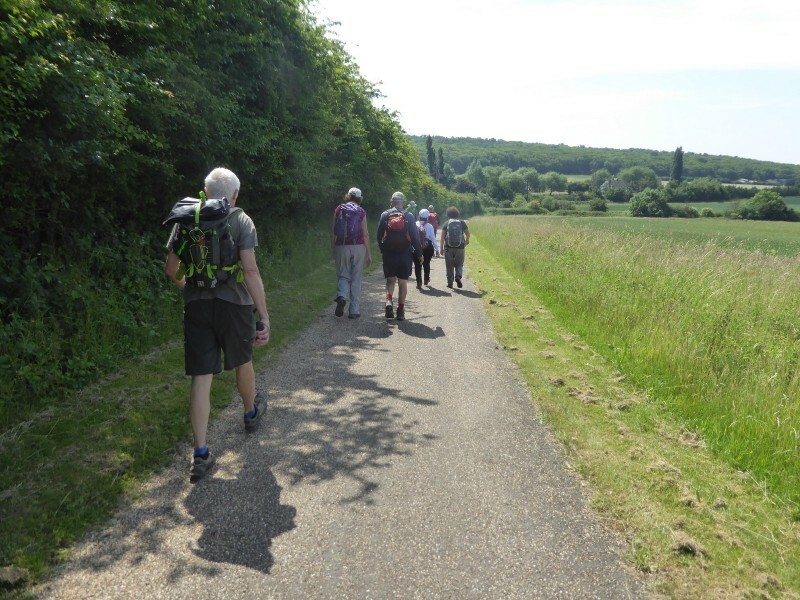 The sun shone all afternoon as we followed the Greensand Way for a time, then passed the Gunpowder Mills near Chilworth before climbing Pewley Down and returning to Guildford Station. 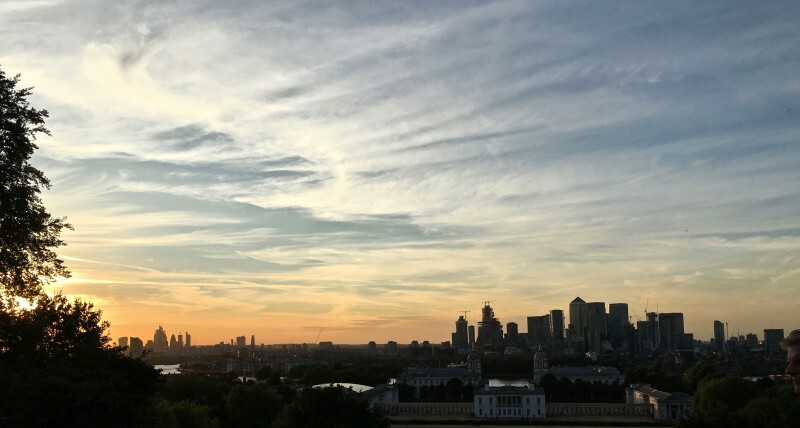 On Thursday evening 14 members started from St. Paul's at the appointed hour and all were delivered safely and in good order to Greenwich in 2.25 hours. En route they enjoyed views of the Thames and the Docks, not least the view from Island Gardens to the Royal Naval College, thought by some to be the finest view in London. 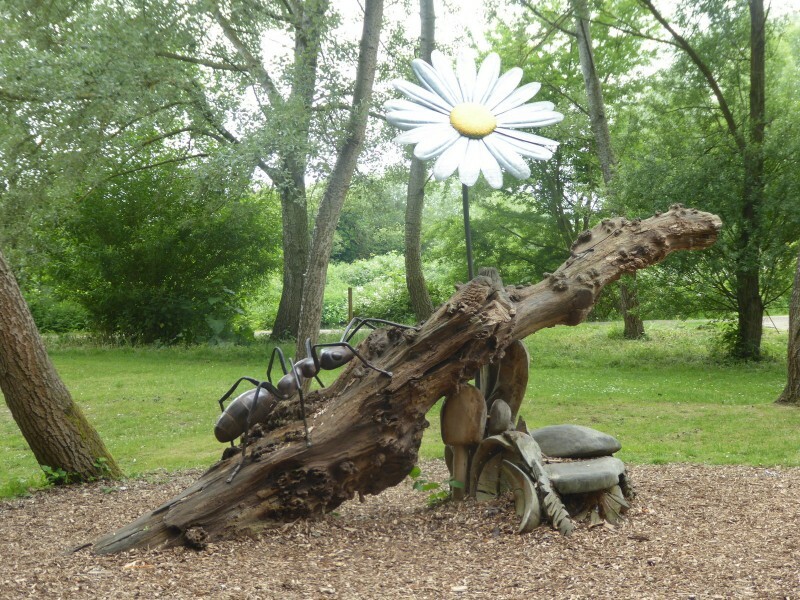 They visited Mudshute Farm with its animals, were enchanted by the llamas and pigs. 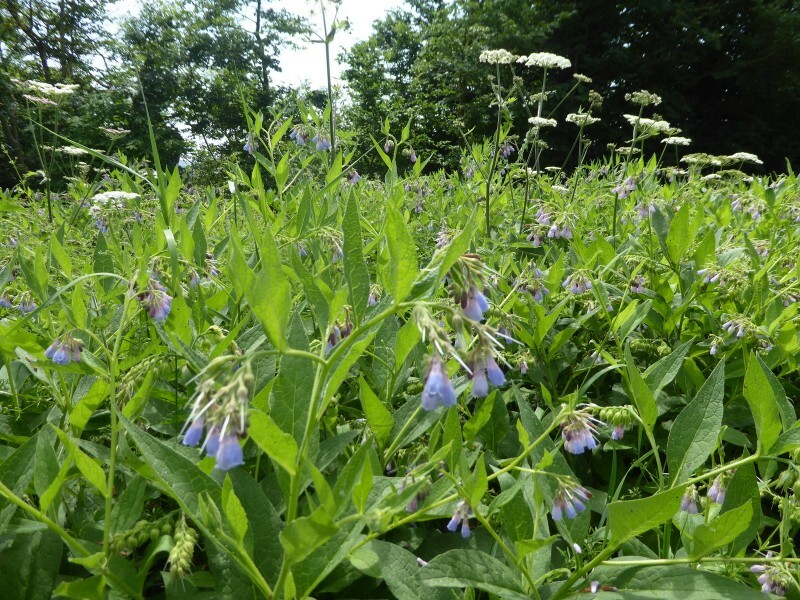 Although in places there were stinging nettles to contend with, there was no whingeing. 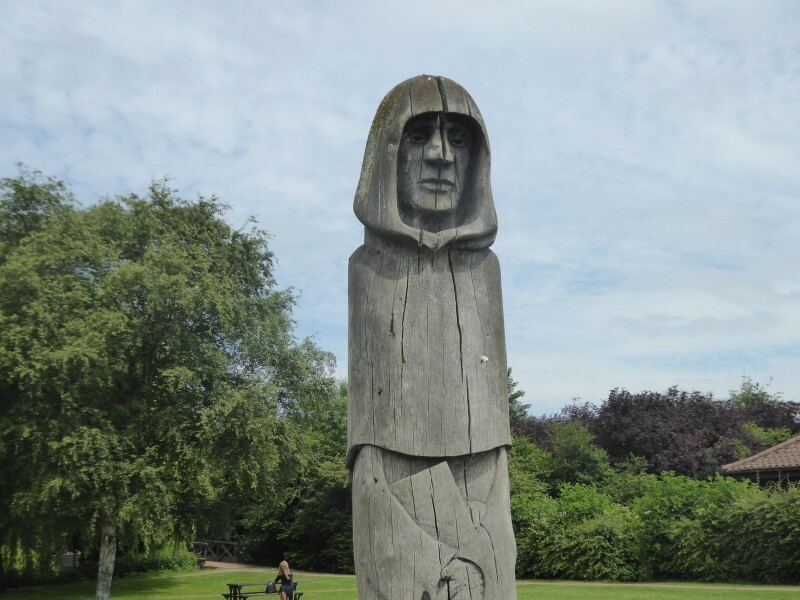 The weather was clement and the natives friendly. Passing under the foot tunnel to the South Bank the party reached Greenwich where the walk officially ended. Some made their ways to their respective homes, others led by Dave who was on auto-pilot, headed at a much quickened pace to Wetherspoons. There the leader was toasted and the party set to with hearty appetite to do justice to Thursday curry evening (although unfortunately the curry ran out before all had ordered). 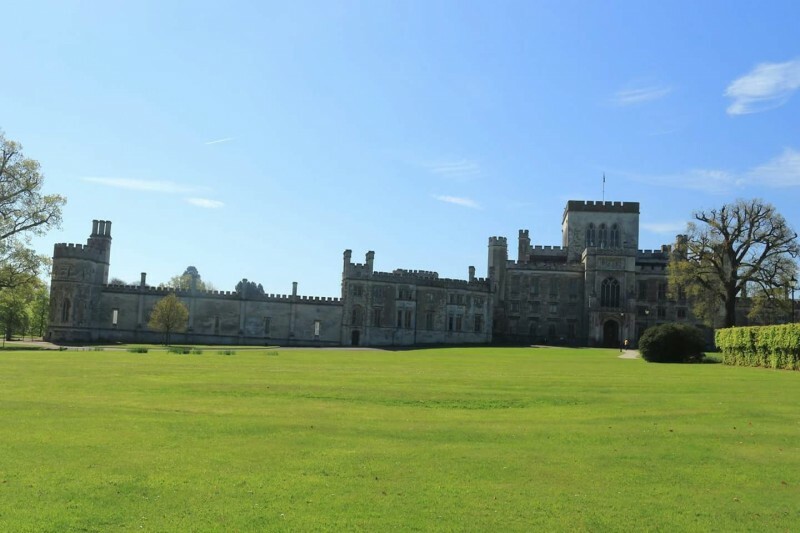 A fine May day brought out a select group who were not seduced by the alternative attractions of Windsor and Wembley. With hard baked surfaces, it was difficult to believe that only a few weeks ago we were wading though mud. Barely a trace of it now. 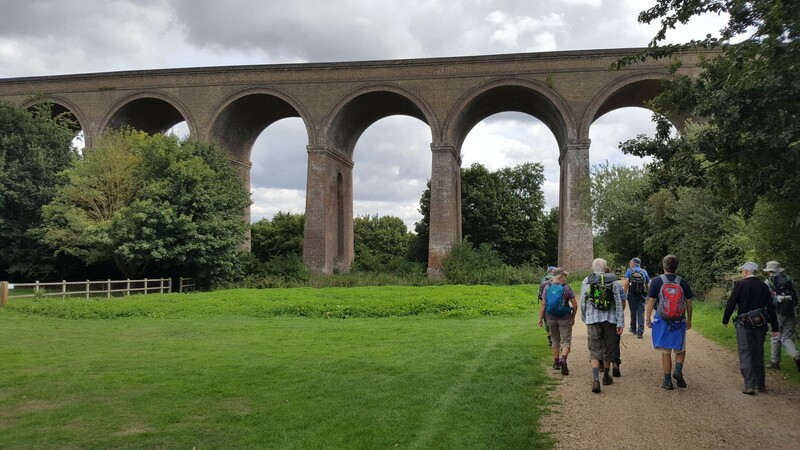 Colin Saunders’s excellent route description of the Vanguard way took us from East Croydon to the end of Selsdon Wood and then it was the London Loop and variations. 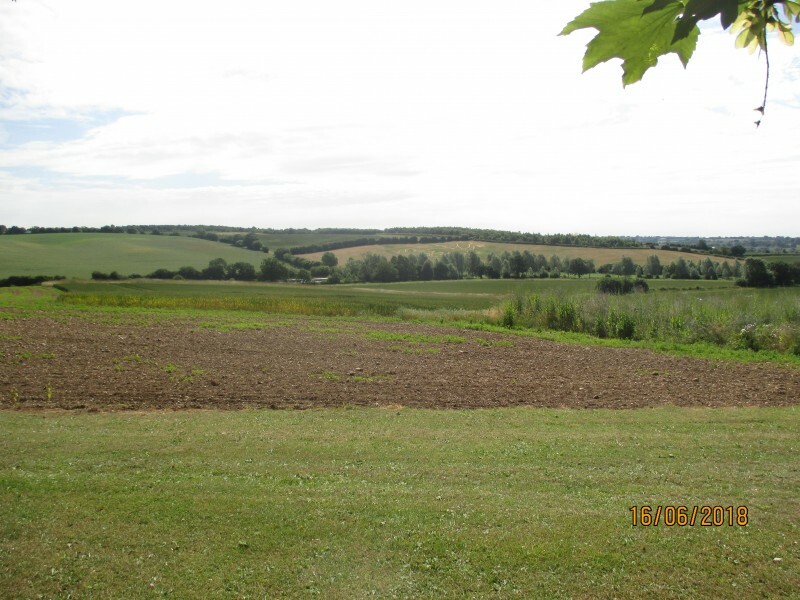 A spectacular view of Upper Warlingham lead to the WW2 aerodrome at Kenley where restoration work is going on. 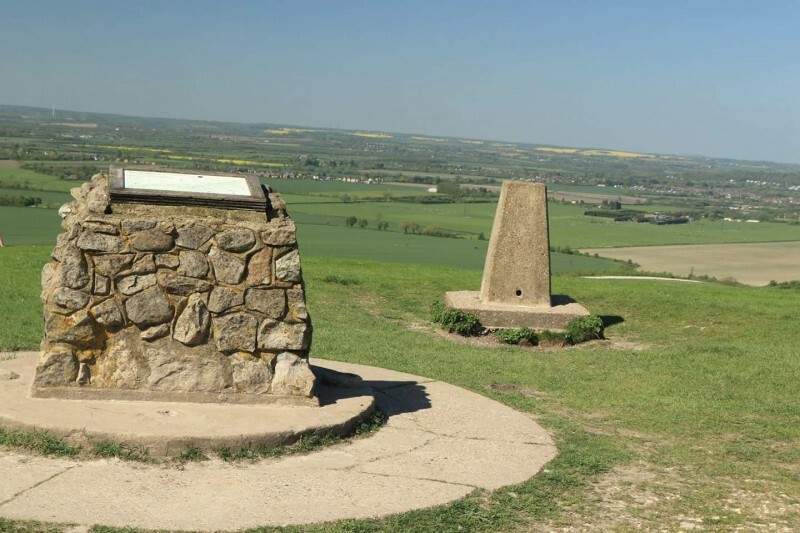 Lunch on the common or the pub on Old Lodge Lane and then Coulson common, over Dean hill and Chaldon church where Pillbox persuaded us to have a cultural break and view the spectacular description of hell hanging on the wall. It all seemed rather jolly. 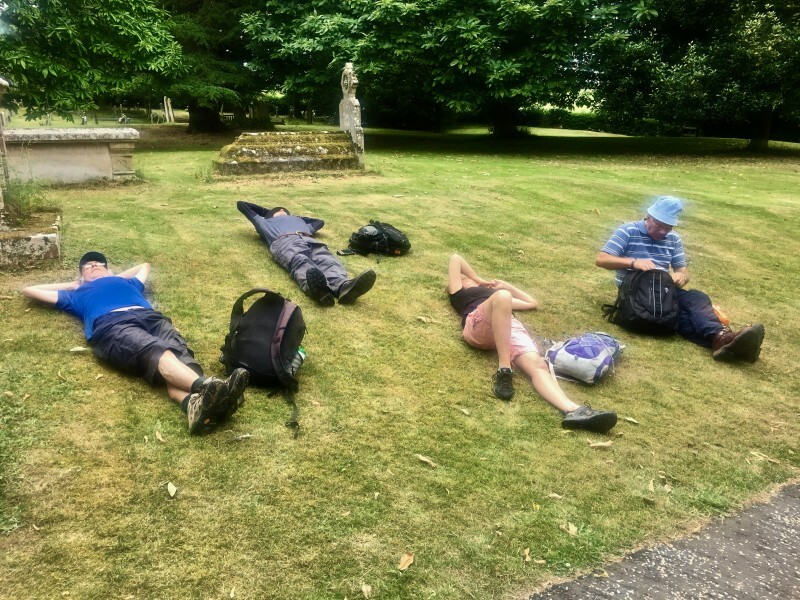 A short stretch on the North Downs Way and then a rather loopy descent to Bletchingley for a much needed refreshment stop with ice cream for some. 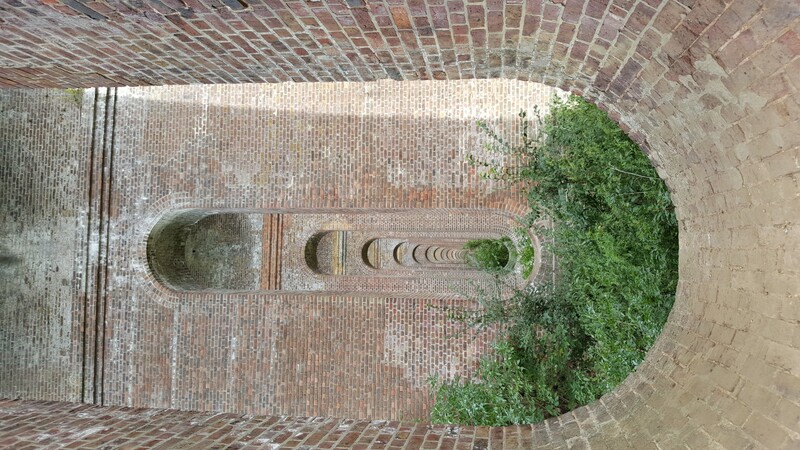 A final section on the Greensand way and an impressive eerie tunnel under the M23 took us to Redhill for 5.30 as promised. 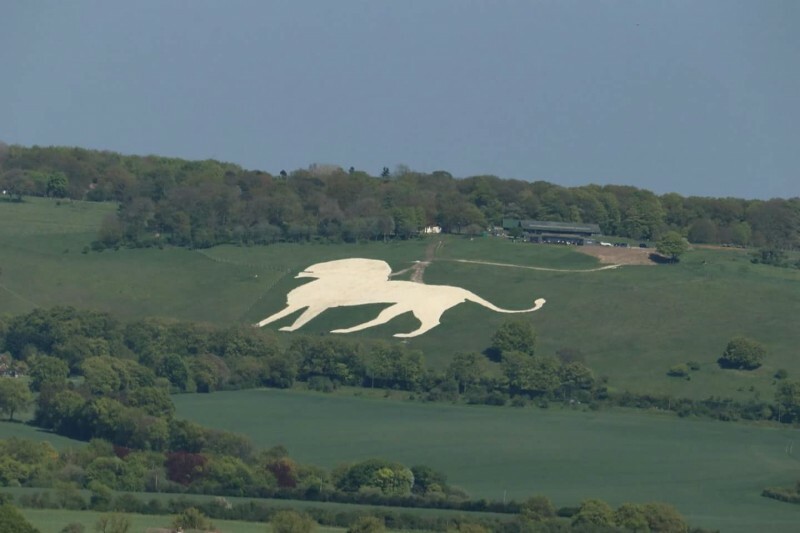 Part 2 from Redhill to Balcombe to follow in July and special prizes to those who do all 4 sections. 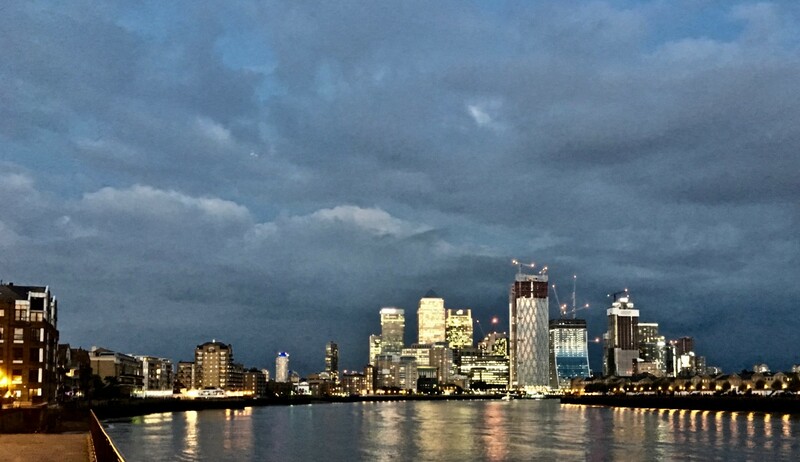 Cool cloudy evening for the start of this year long Thames to Channel traverse. 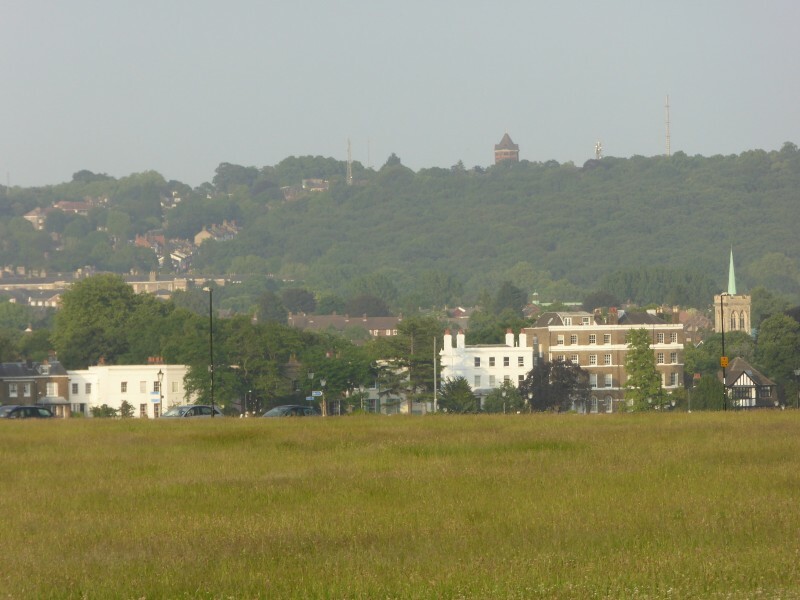 From Wandsworth Town station we were soon on the green spaces of Wandsworth common passing the imposing Royal Victoria building and joining the Capital Ring toTooting Lido and Streatham Common. 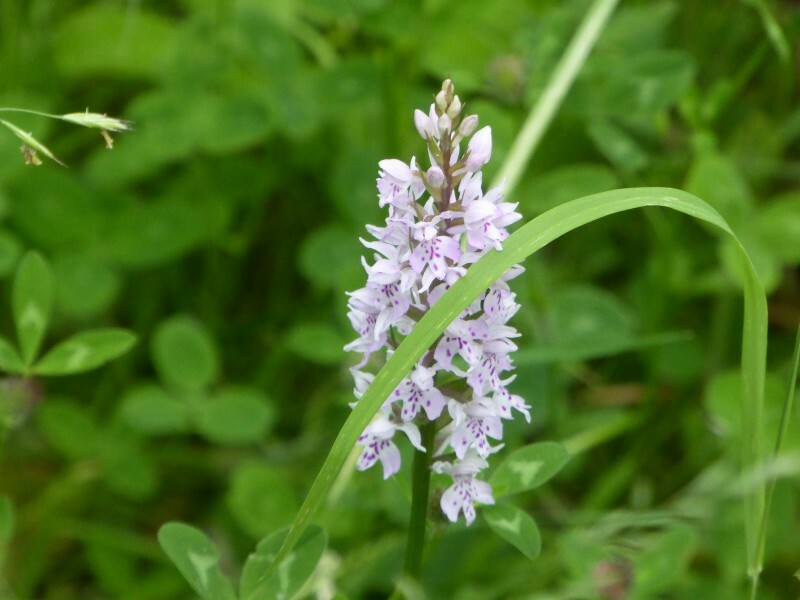 An urban section headed to Mitcham common with a small nature reserve, created out of old railway sidings. 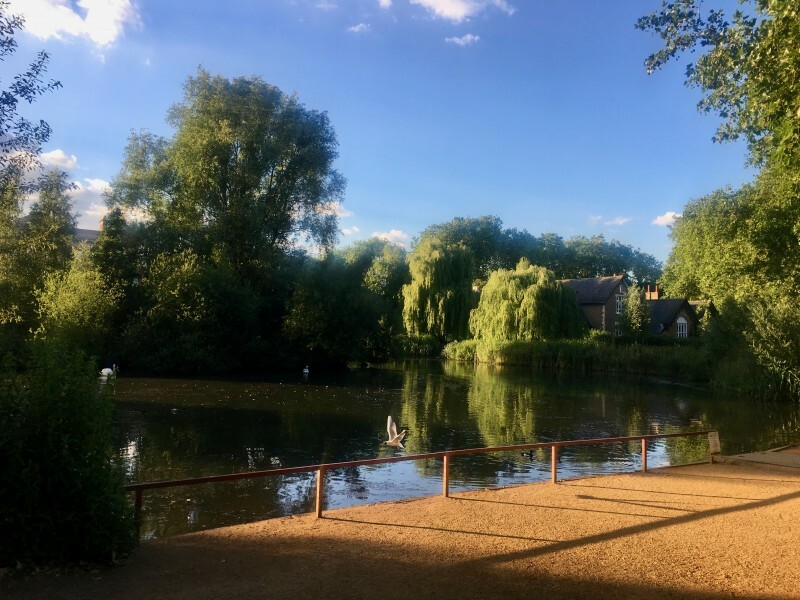 The sun came out for the last stretch to give us a lovely sunset over a small lake on Mitcham common and some good views from the hillocks. A fine end to the walk for the birthday girl in the group. 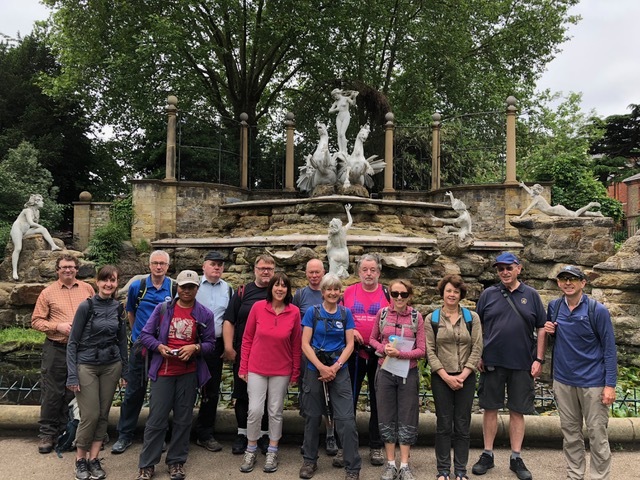 Thanks to Douglas volunteering at short notice to lead the walk on the ground, the Womble was able to go ahead as planned but with a reduced mileage, no visit to Bushy Park. 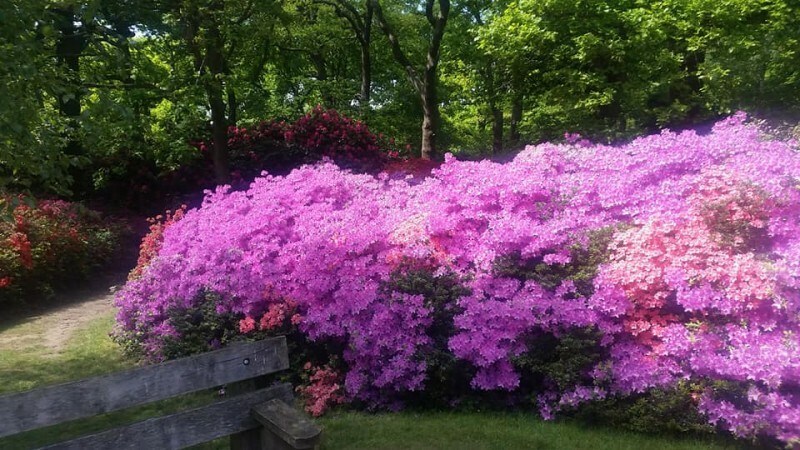 Perfect weather, glorious Spring colours, a picnic amongst the azaleas in full glorious bloom. 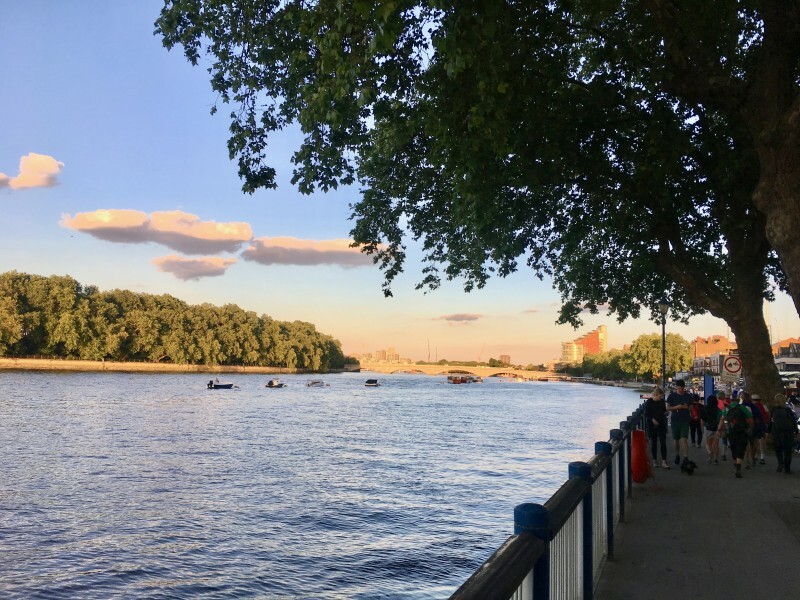 a drink by the enthralling river and the usual good company ensured that what for many is a familiar walk was also one of the best. 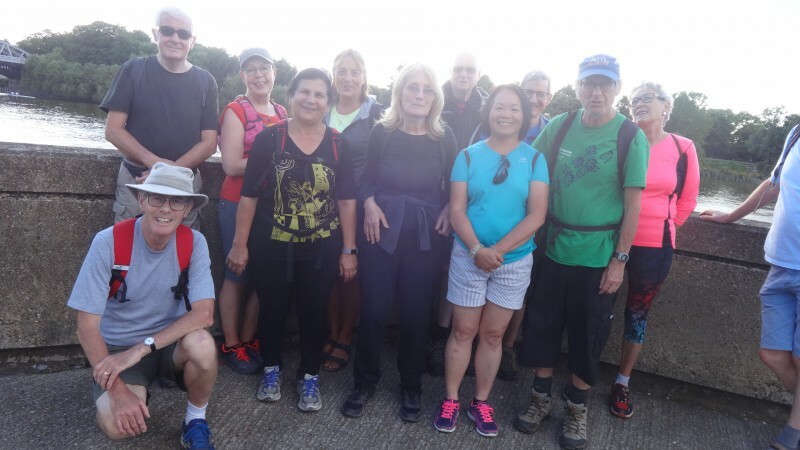 24 of participants including me, enjoyed a pleasant social walk. 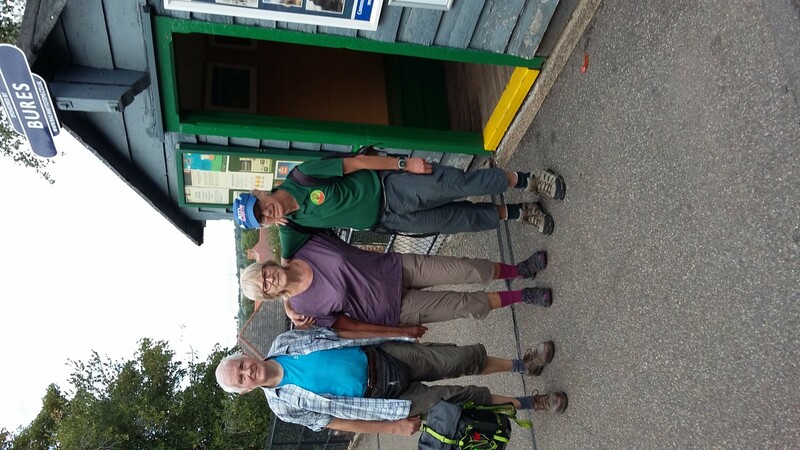 The 20 miles started from Berkhamstead stn and finished in Tring stn. 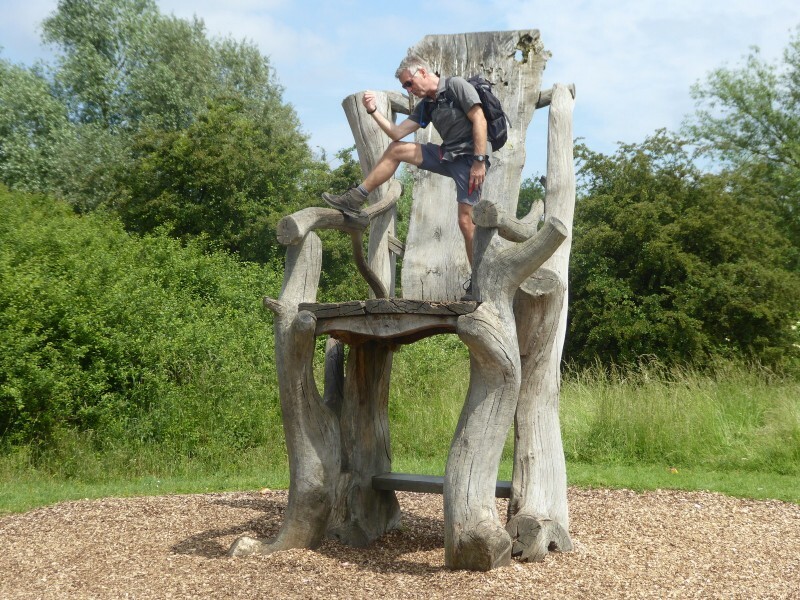 We walked through Berkhamstead common, Ashridge Estate, Gadsden and Ivinghoe. 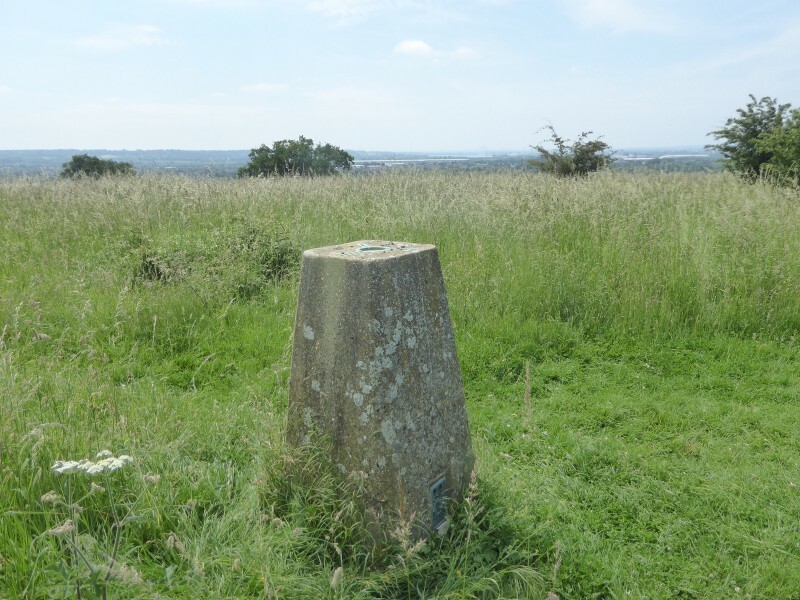 Points of interest were remnant of Berkhamstead Castle, Ashridge Hult International Business school, little Gadsden church, Whipsnade zoo, Ivinghoe Beacon & Bridgewater monument. Iain, a guest walker and Samira (a woman I believe to be a member) both seemed to find the pace challenging, so we often had wait for them to catch up. 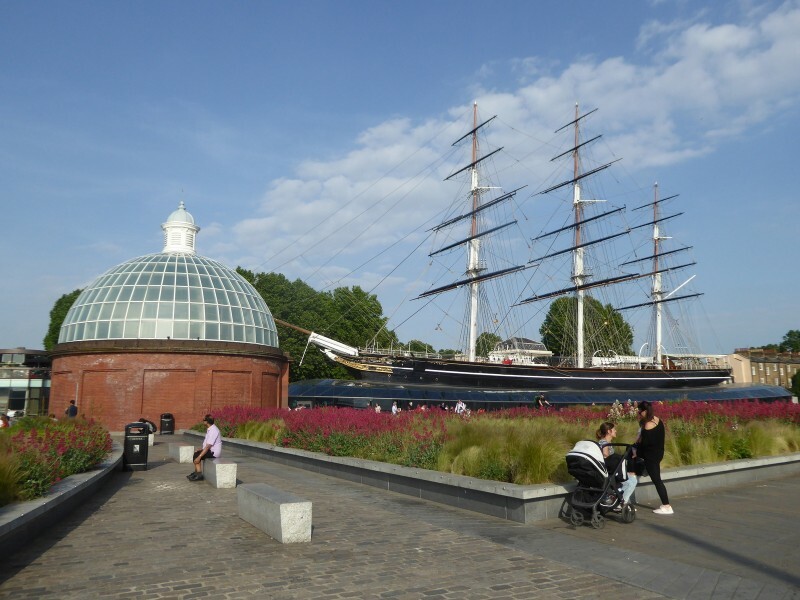 A pleasant stroll up and down the hills of Greenwich Park with an excursion to the Royal Standard at Blackheath followed by refreshments at the Gate Clock by the Cutty Sark.